Anyone who knows my husband knows that he is very serious about breakfast. It is by far his most important meal(s) of every day. Entire vacation plans have been set around a certain breakfast. 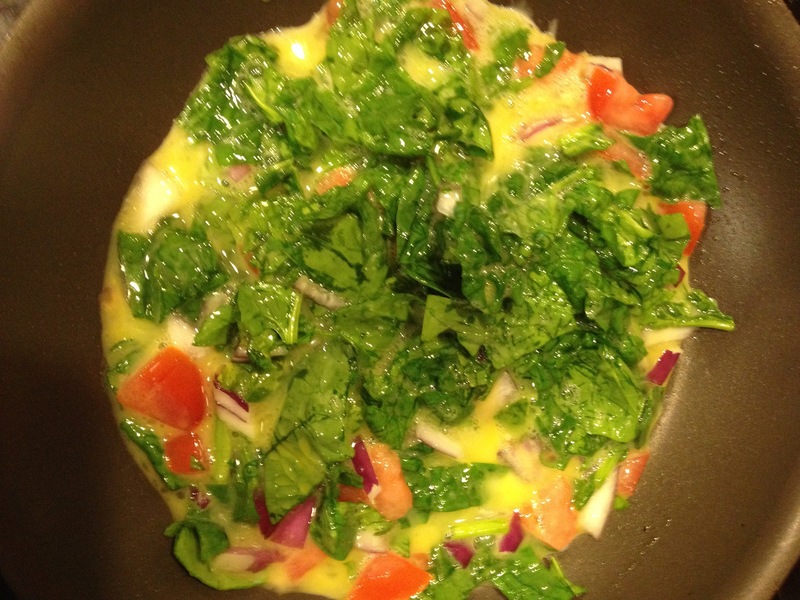 In addition to his love for eating breakfast, he also believes himself to be “The Omelette King”! He has his technique perfected and really enjoys it. 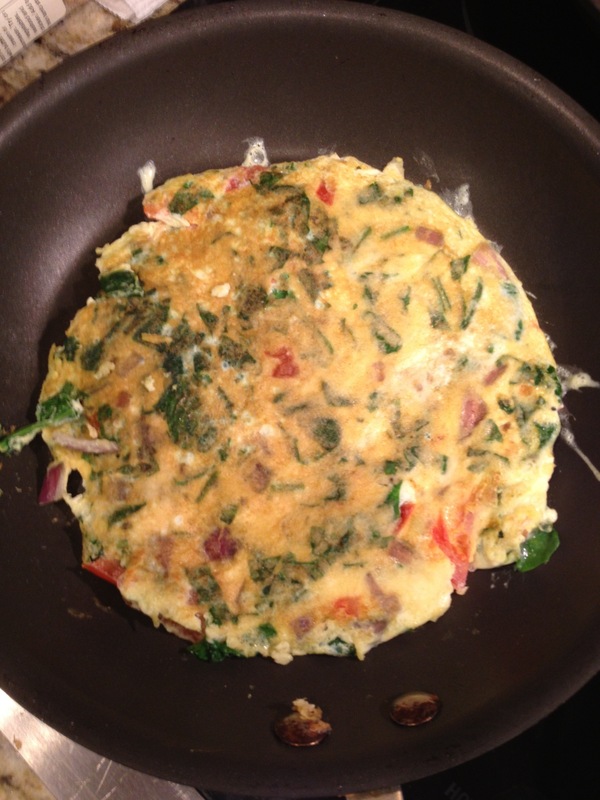 He loves to experiment with omelette fillings and they almost always include siricha. Tara asked me to take the lead on this blog post for a couple of reasons. 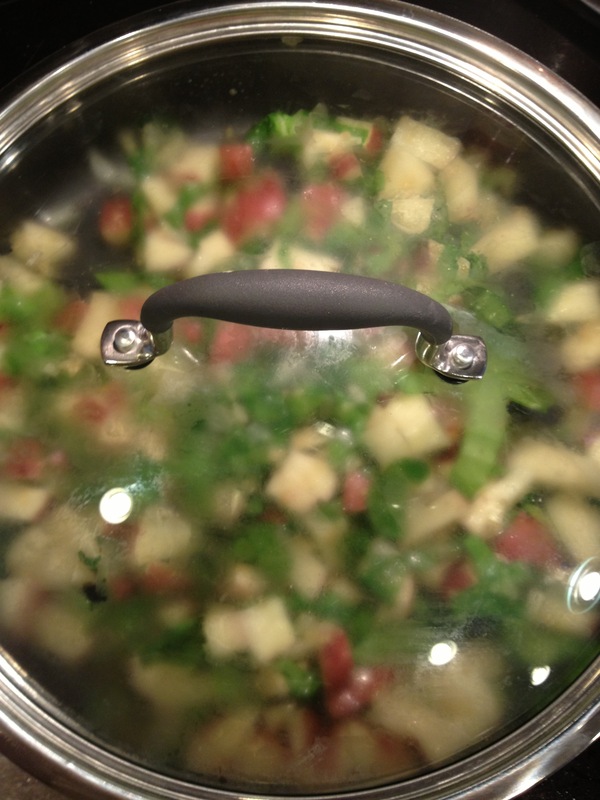 1 – I made the dinner, I guess it would be kind of foolish if I make the dinner and Tara would get all the credit, right? 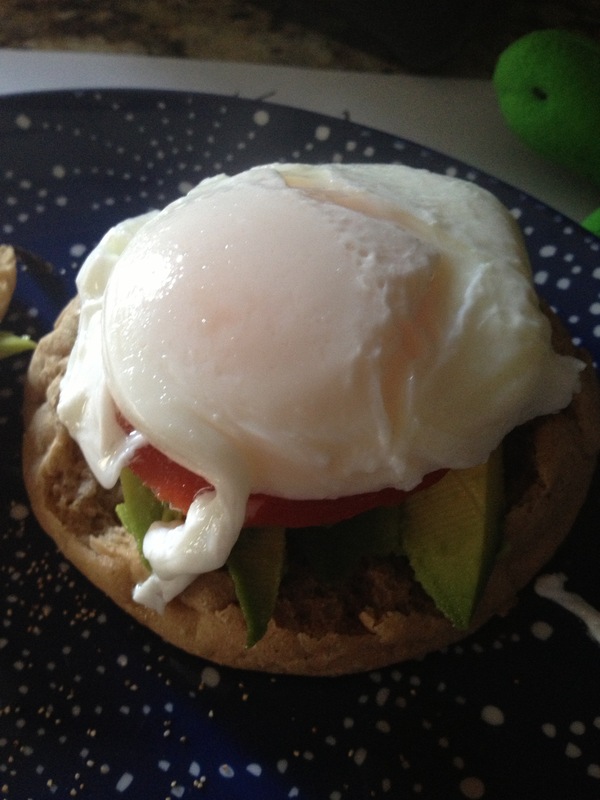 2 – I have a weird obsession with breakfast food. I don’t even like calling it breakfast food because I want to eat it all the time. Is better food more appropriate? 3 – I have an even BIGGER obsession with eggs. It’s kind of scary how many eggs I want to eat at a given meal. The style doesn’t matter, the meal doesn’t matter. It’s gotten to the point where Tara has said to me on multiple occasions, “Can you please stop talking about eggs? 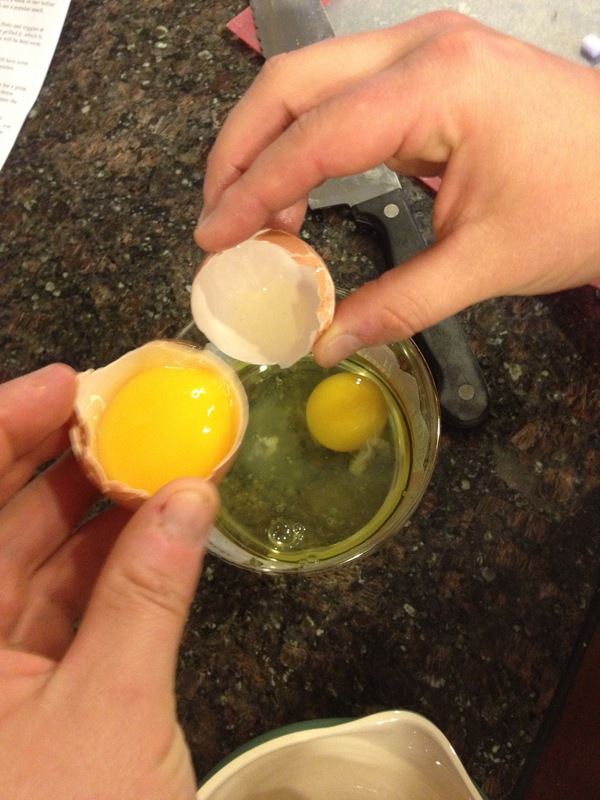 ?” Maybe she thinks that by letting me write this blog post I’ll get all my “egg talk” out of my system. No way, especially since there’s a 90% chance I make eggs again for dinner tonight. 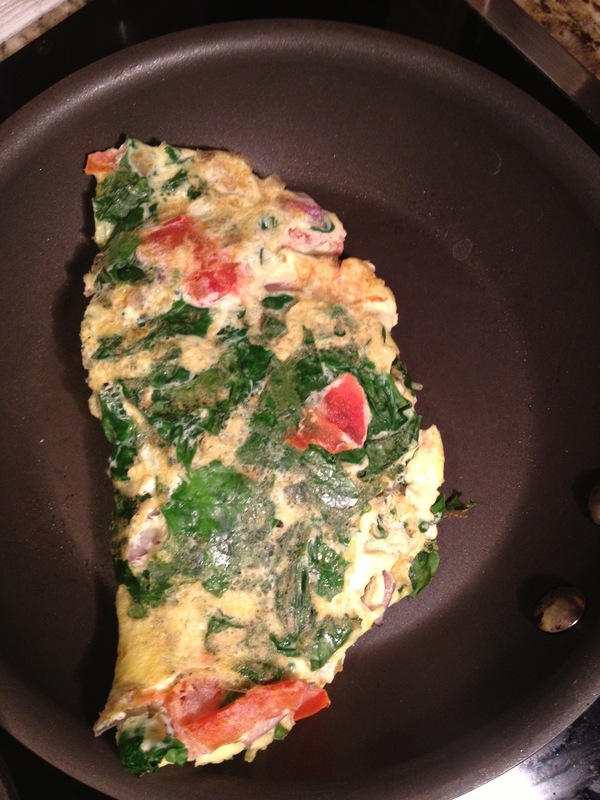 I started making omelets a few years ago. I didn’t really follow a recipe, I just started small by mixing some eggs into a bowl, adding whatever i felt like, and then pouring it into the frying pan. It seems simple enough, but the truth is I probably burned dozens of omelets at first. Apparently stoves have temperature settings other than “HIGH”. After a while, I started getting the hang of making omelets. Typically we’ll just look in our fridge, and if there’s something that makes sense, we’ll throw it in. Tomatoes? That works. Avocado? Awesome. Broccoli? Never ever ever in mine. Put them in a pan over medium high heat and cover them, cook for about 30 minutes. 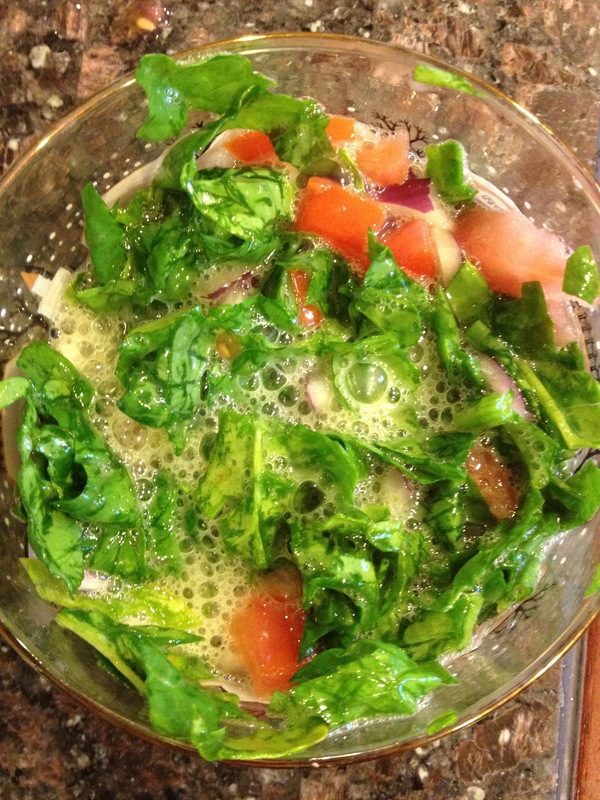 Chop the spinach, tomato, and onion and add to the bowl. 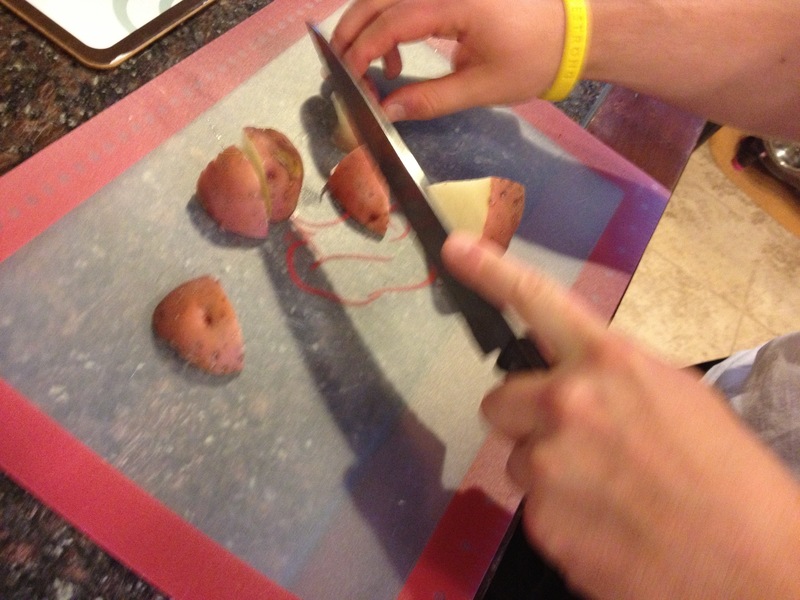 Then add the cheese to middle, fold, and finish cooking! I don’t know about everyone else but I’m a big fan of quick and easy weeknight meals. Bonus points always if you can turn it into lunch for a day or two as well! It took me a long time to break Jason of his turkey sandwich habit… Seriously I call it a habit/addiction because he was eating this lunch every day for the past ten years…. No variation… Even on a trip out to lunch it was always turkey and Swiss. We have tried to eliminate most breads unless its for a treat or homemade, and we are always on the lookout for a good leftover to bring for lunch. Something that we have discovered that both of us love is couscous salads! It’s quick and easy to make and usually will last us a few days. So when I stumbled across a recipe for Feta/tomato/olive couscous salad I started to think about how that could work as a dinner and leftovers for lunch. So for dinner the night before we do balsamic chicken topped with tomato/olives/feta and while the chicken is cooking I make the couscous. 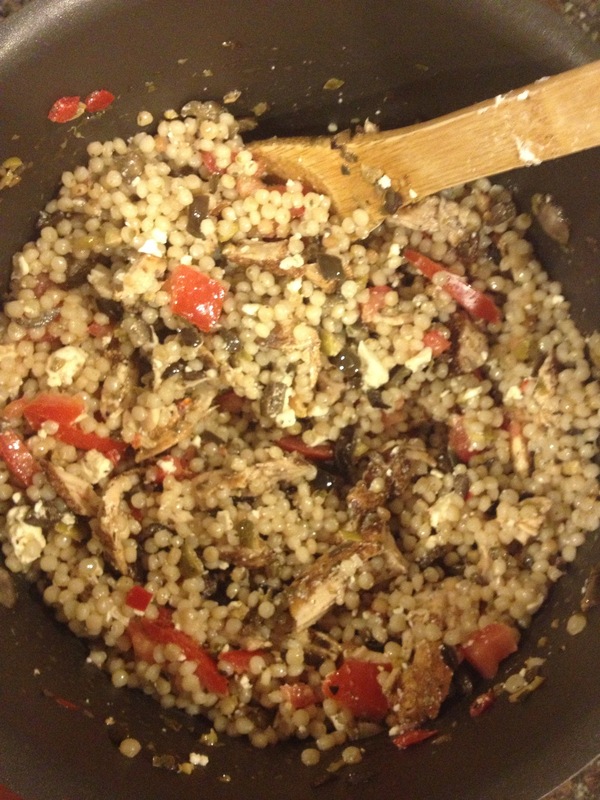 When dinner is done we cut up all the leftovers and throw them into the couscous for lunch! I start by putting the chicken in the grill pan and seasoning both sides with salt, pepper, and garlic. 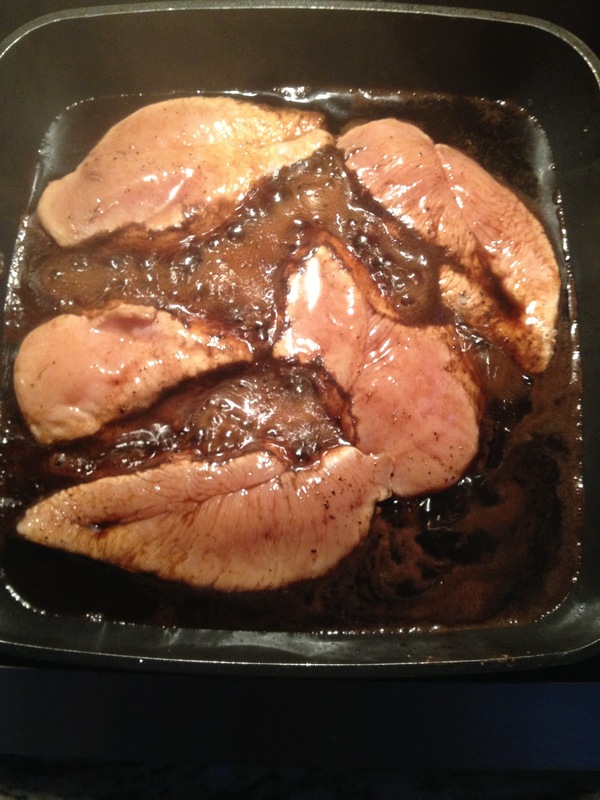 I then pour balsamic vinegar to coat the bottom of the pan and add a little water to it the acidity. Cook the chicken evenly on both sides over medium high heat. 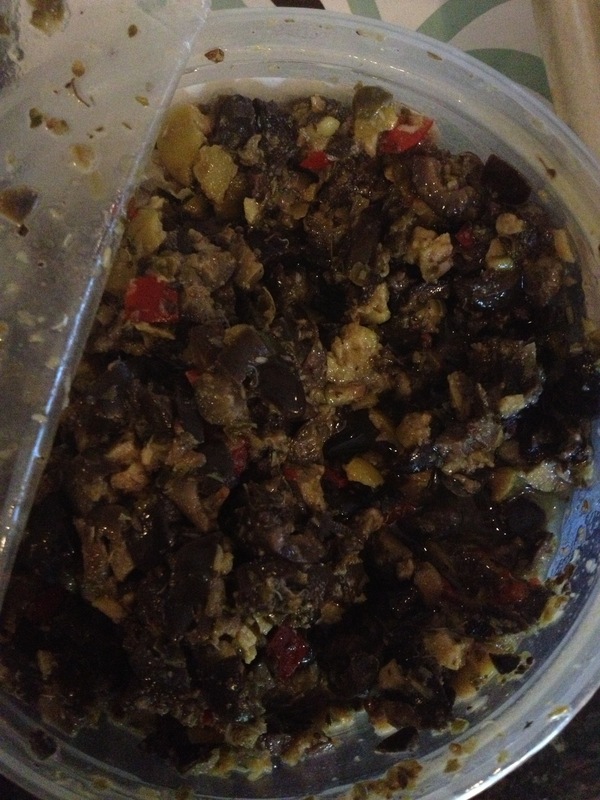 Remove from the grill pan and take some olive tapenade to spread over each piece. 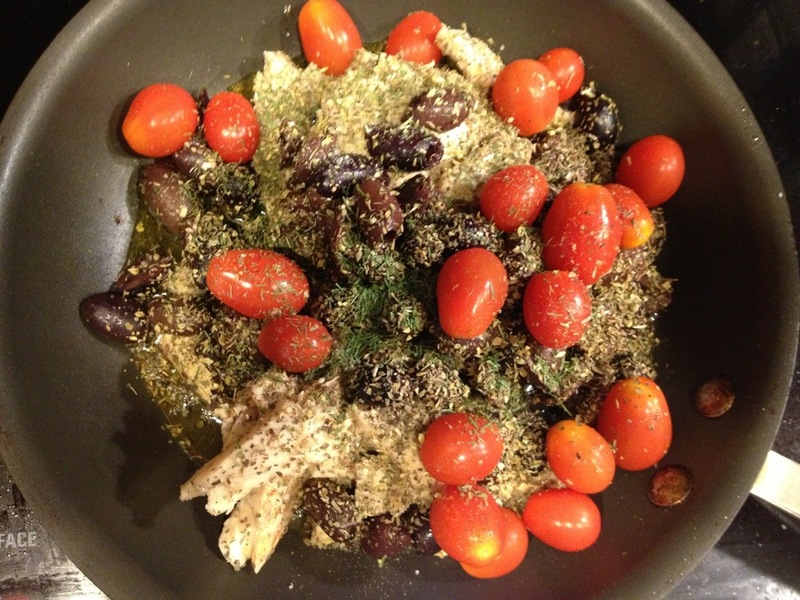 Once the tapenade is on each piece add some chopped tomato. 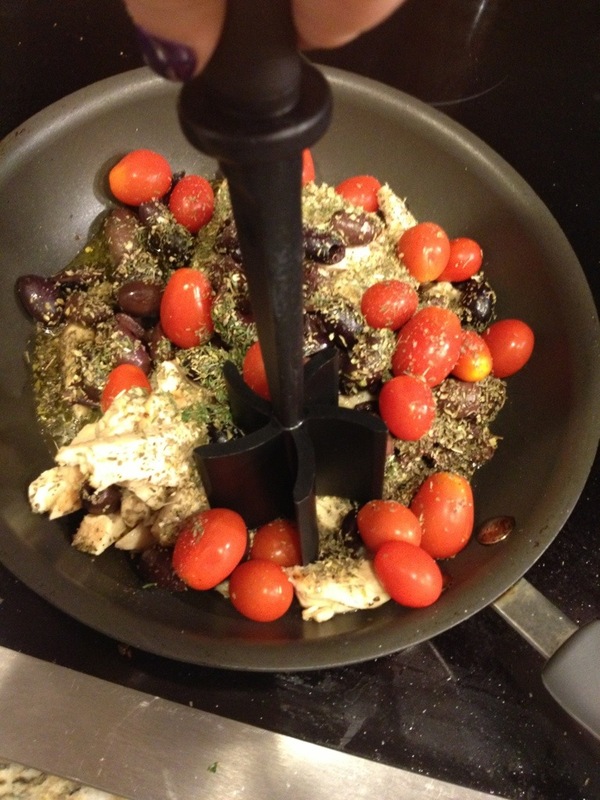 Now sprinkle with feta and they are good to go! 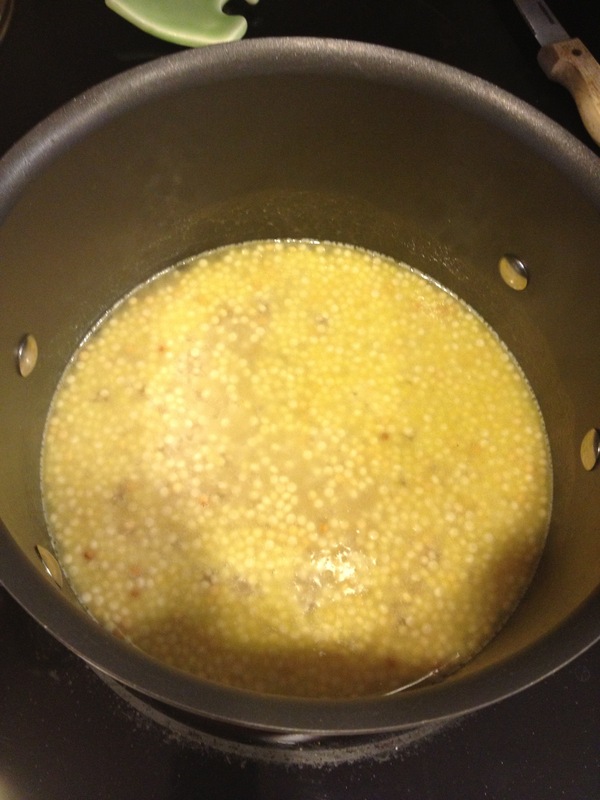 Now for the couscous.. 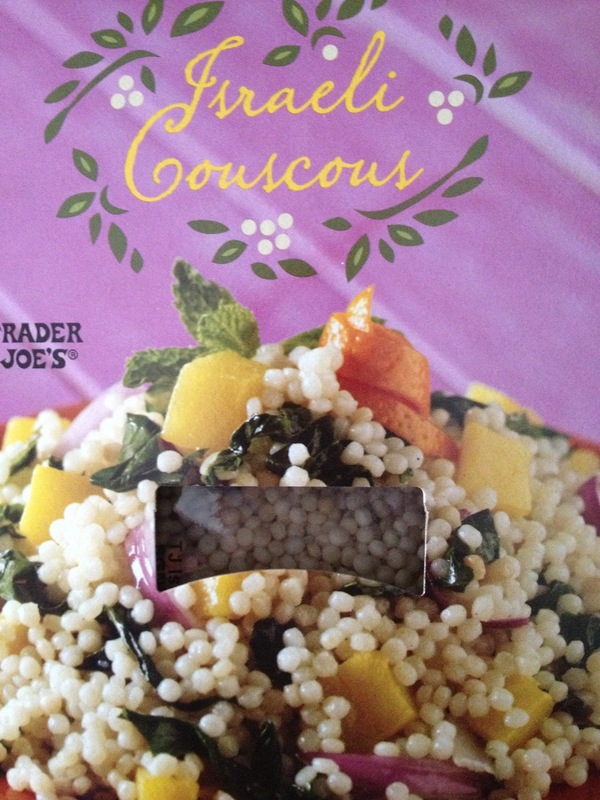 I use the Israeli couscous from Trader Joe’s. 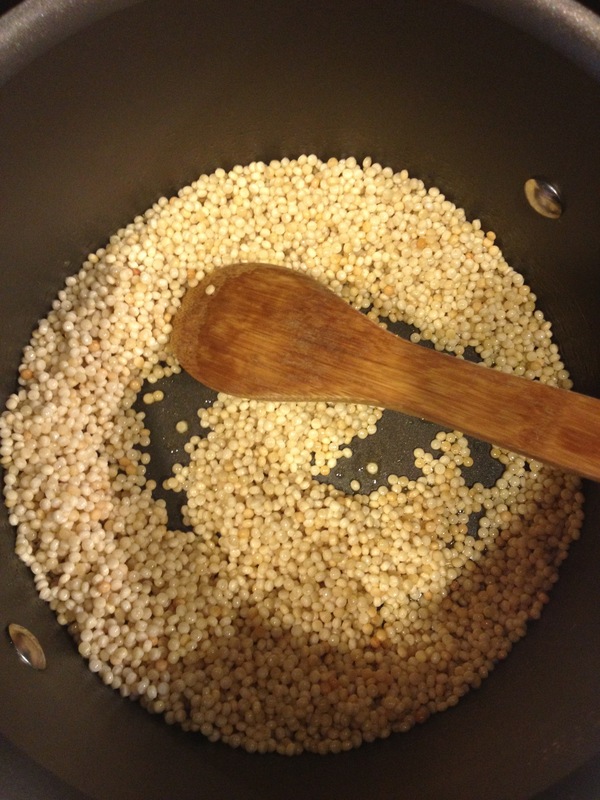 The trick with this couscous is to brown it in the pan with a little bit of olive oil first. Then slowly add hot water to the couscous ( I heat the water in my tea kettle while I brown the couscous) then cook according to package. 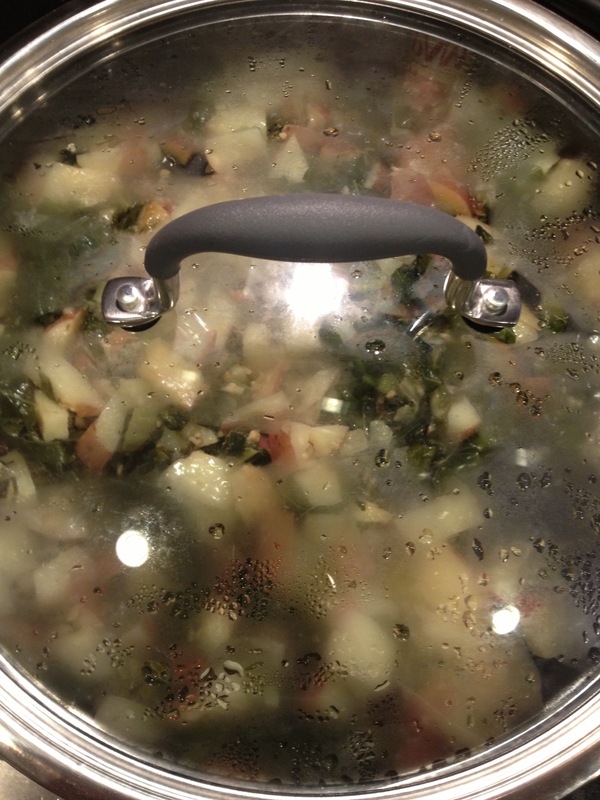 When it’s done cooking, add all of your leftovers and there is lunch for tomorrow or even dinner for the next day! which means more new recipes! 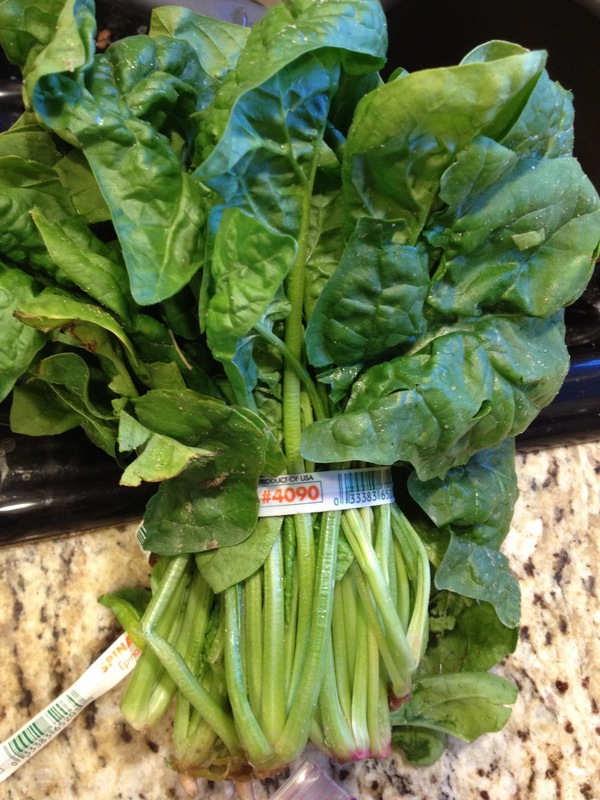 It’s amazing how much receiving a box of fresh produce motivates me to cook more! I’m having a lot of fun discovering new vegetables to love, but nothing is more exciting then when they place the box in your car and the whole car instantly smells like a familiar produce. This week that smell was overwhelmingly basil! One of the first things I do when I get home with the box is sit down and read all the tips, recipes, and comments. 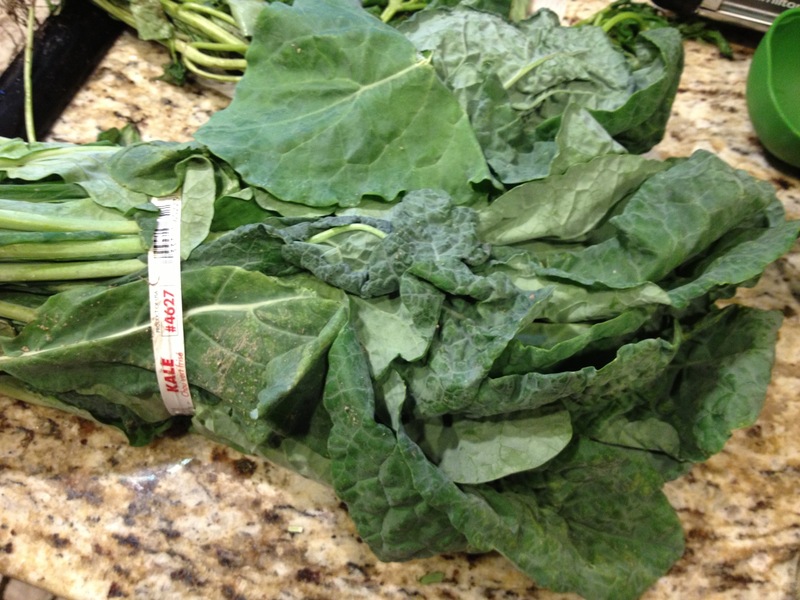 They are so good for learning how to store, wash, and prepare the produce. They also give great ideas and inspiration. 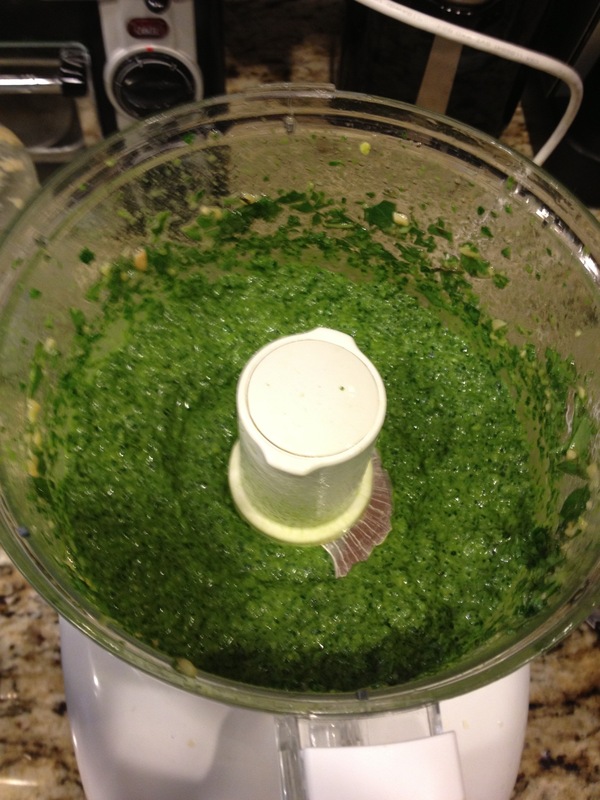 This weeks inspirational tip was to switch out some of your basil for kale when making pesto. 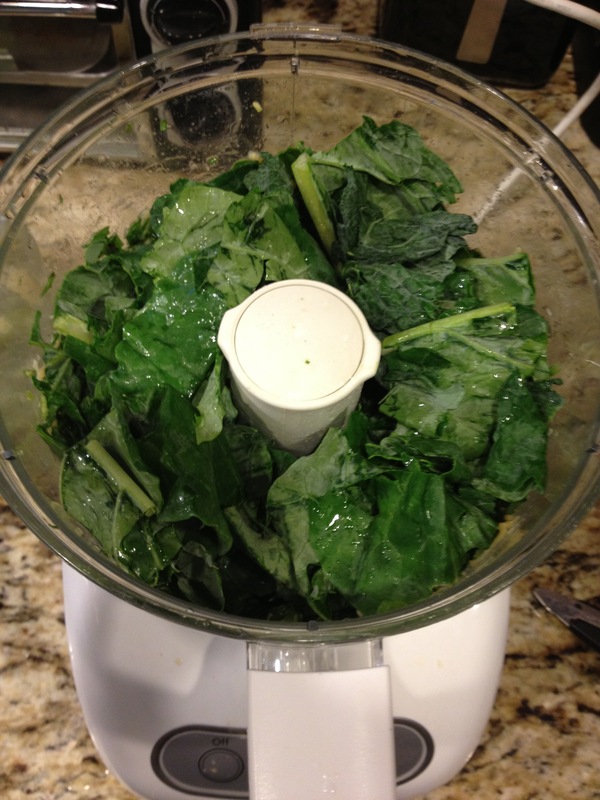 The tip went on to say that the kale even gives it a better flavor in addition the the health benefits. So I thought I would give it a try. 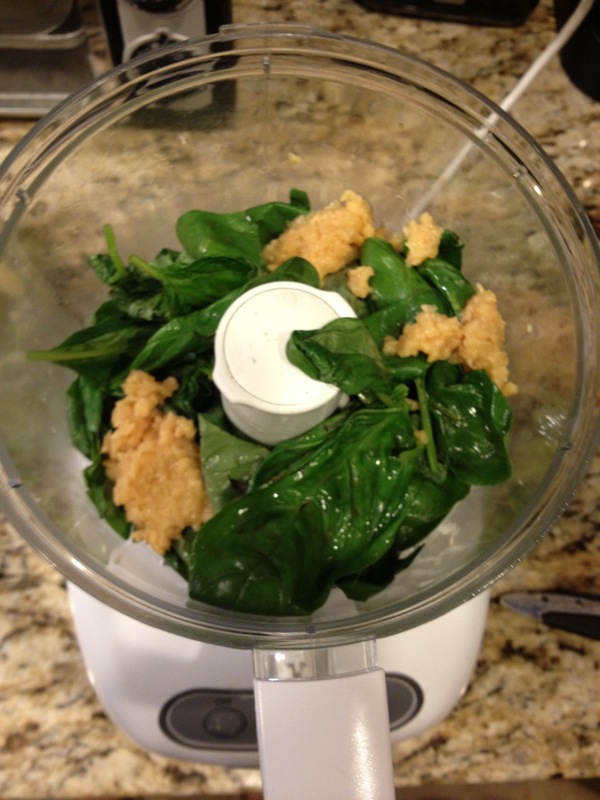 The first thing I did was put all the basil and minced garlic into the food processor. And pulse until no full pieces remain. 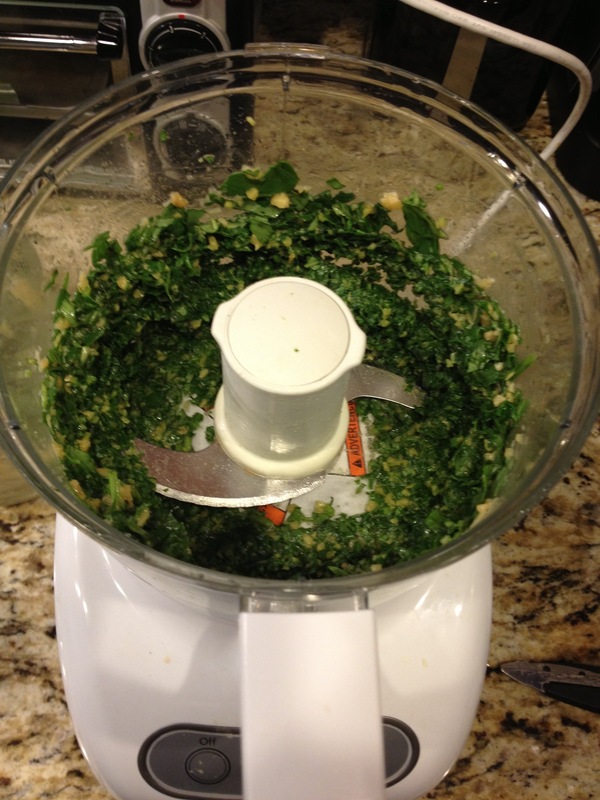 Then I got the Kale ready and put that in. 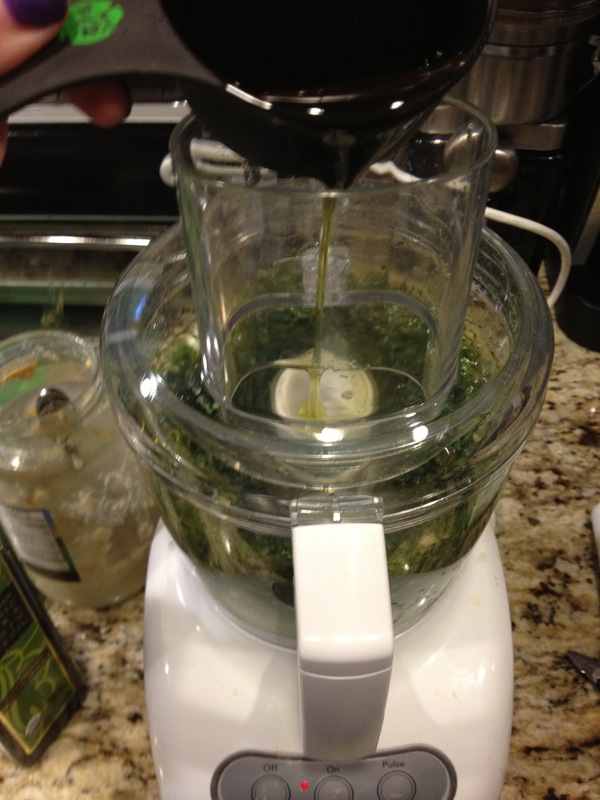 While the kale was blending I poured in half of the oil. 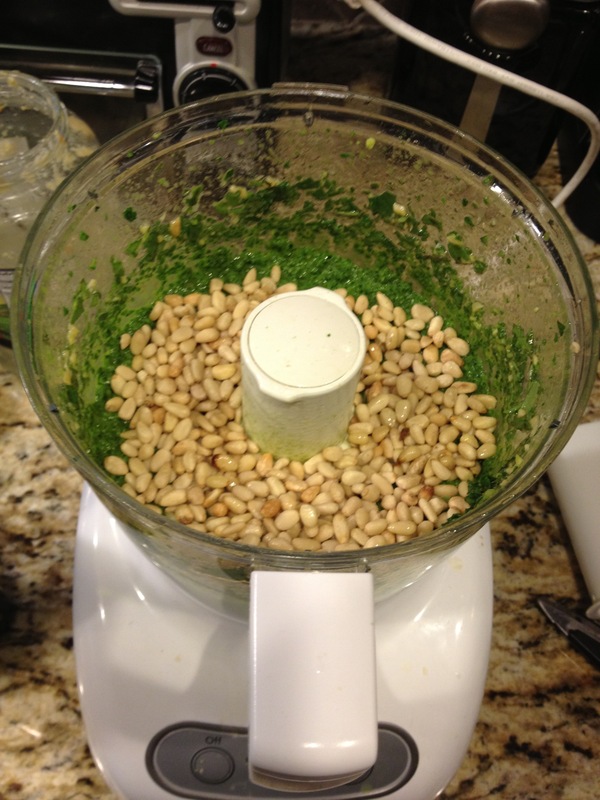 Next I added the salt and pine nuts. 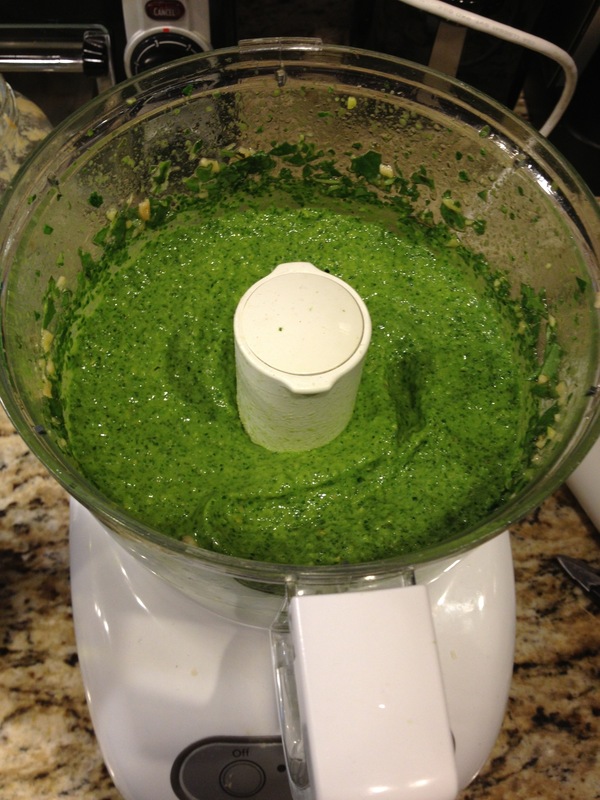 Now what to do with the Pesto…. 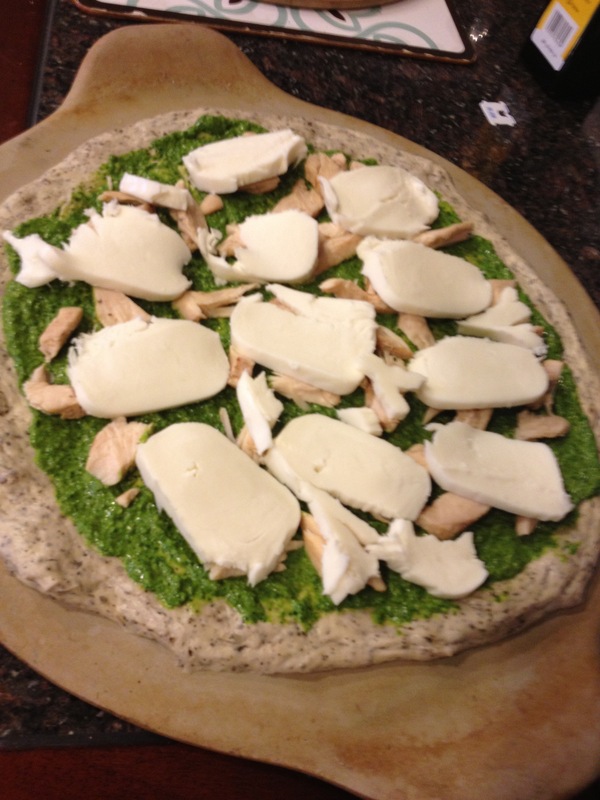 Make a pizza of course! 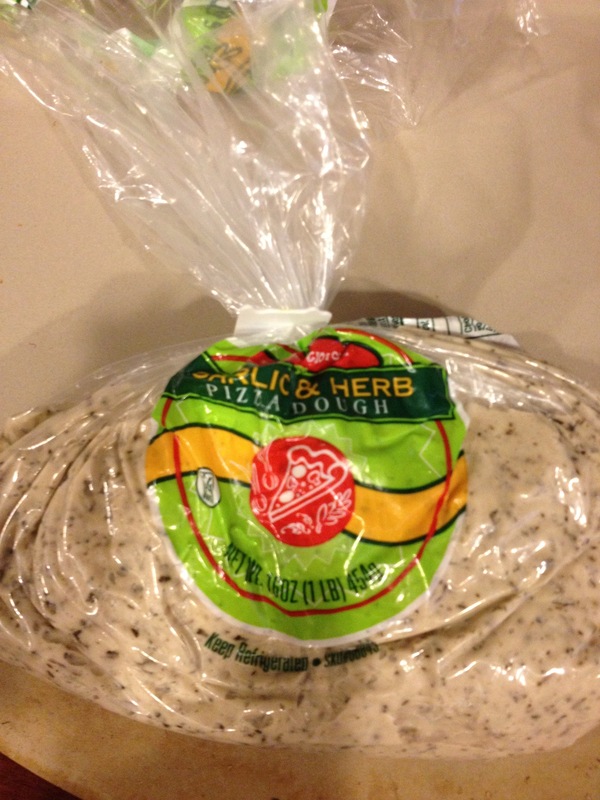 When I don’t have time to make homemade pizza dough I go to trader joes and buy their garlic and herb dough. 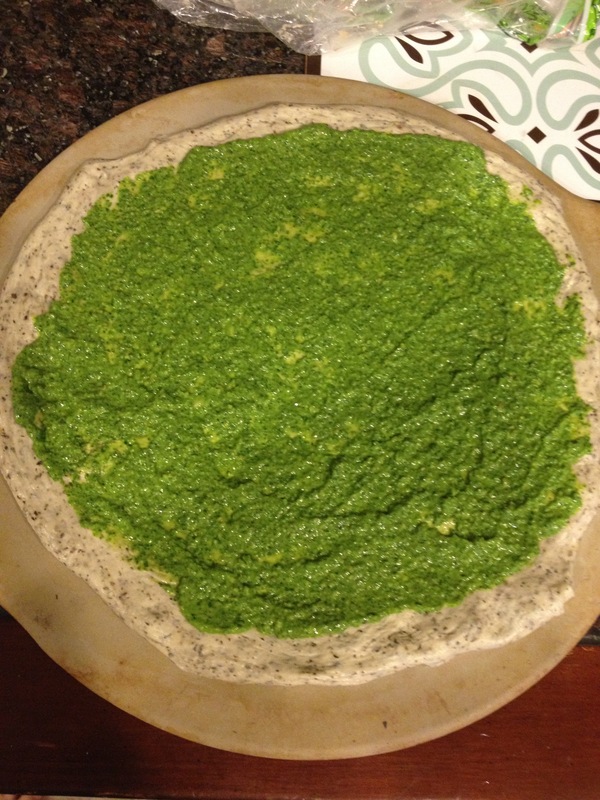 Now to make the pizza spread out the pizza dough and add the pesto! I added the Perdue shortcut chicken but you could add any leftover chicken. Cut up some cheese and put it on top. Bake at 425 for about 25 minutes and enjoy!! 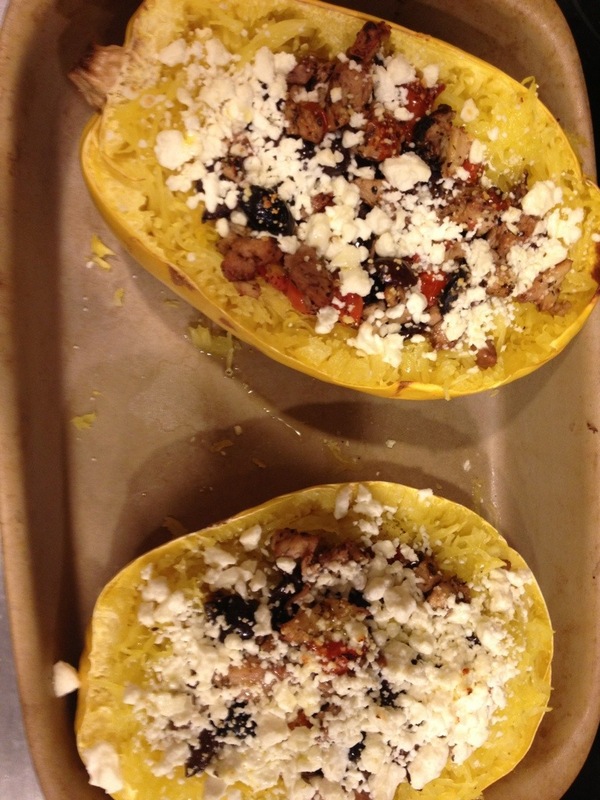 We are on a big spaghetti squash kick right now and pretty much whenever we see it we grab a few. Jason and I love experimenting with substitutions ad this is our favorite by far! Well…. 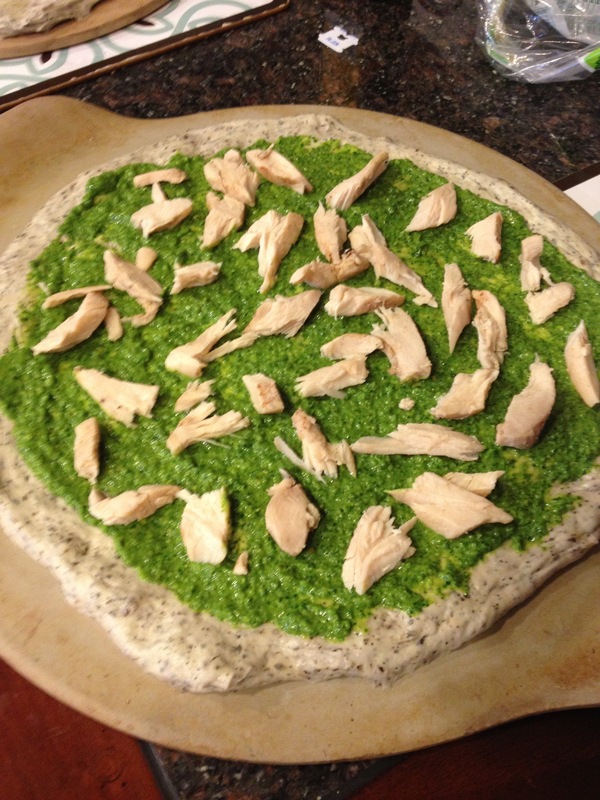 Maybe a close second to cauliflower pizza. 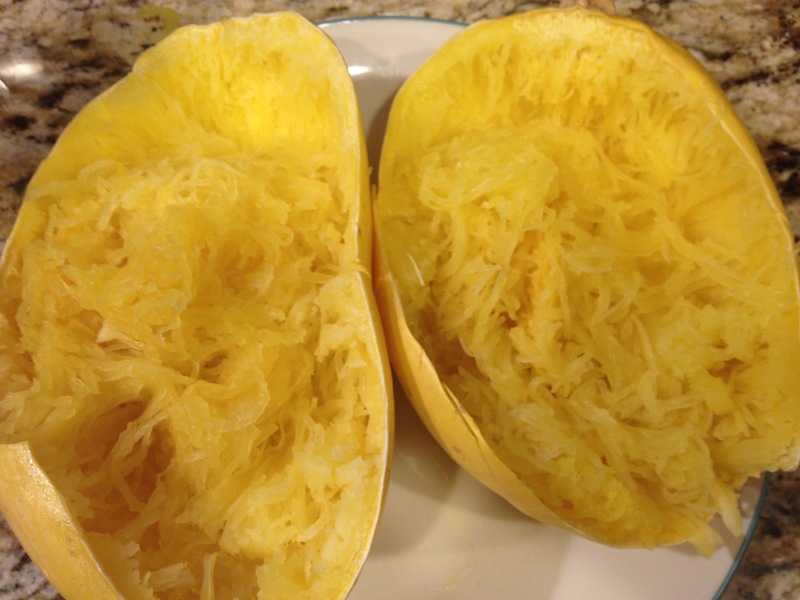 To start cut the spaghetti squash in half (the hard part), scoop out the seeds, place flesh side down and microwave for 10-15 minutes. 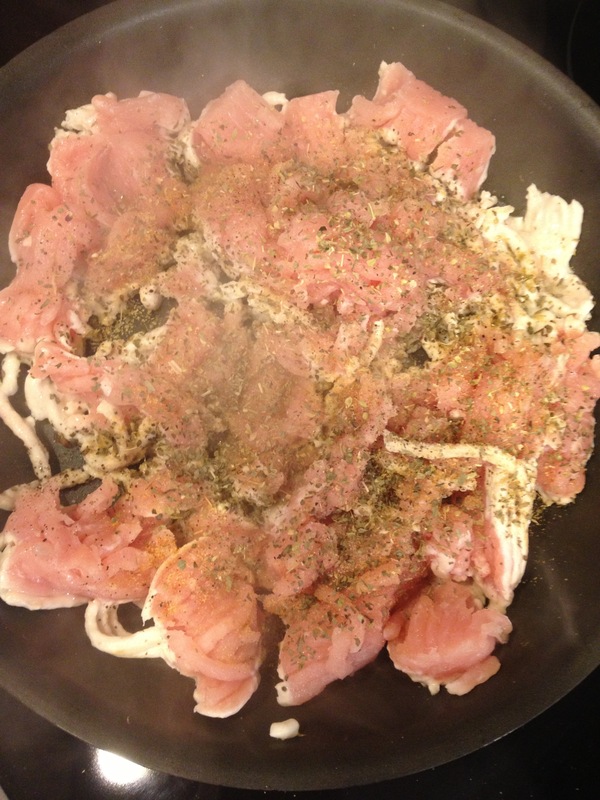 While the spaghetti squash was cooking I got started on seasoning and cooking the ground turkey. 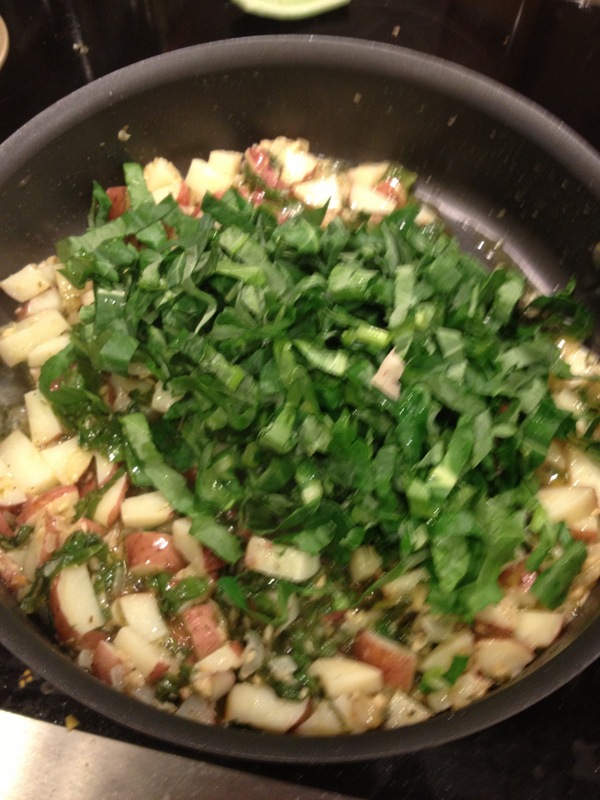 I used basil, oregano, salt, pepper, and garlic. Cook until no longer pink. When it’s cooked pour your turkey and sauce into a saucepan to warm. 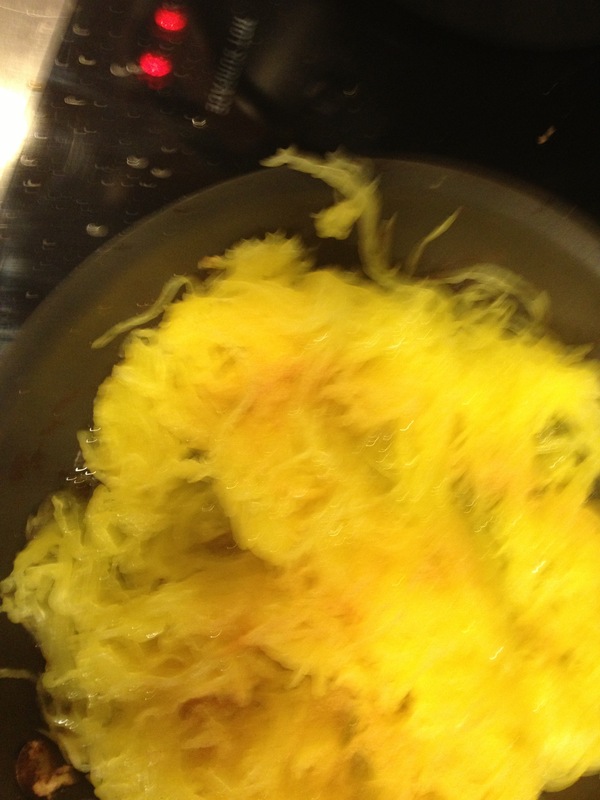 Next I put the spaghetti squash in a frying pan with some olive oil and garlic to give it a better taste. You only need to leave it in for about 2-3 minutes. 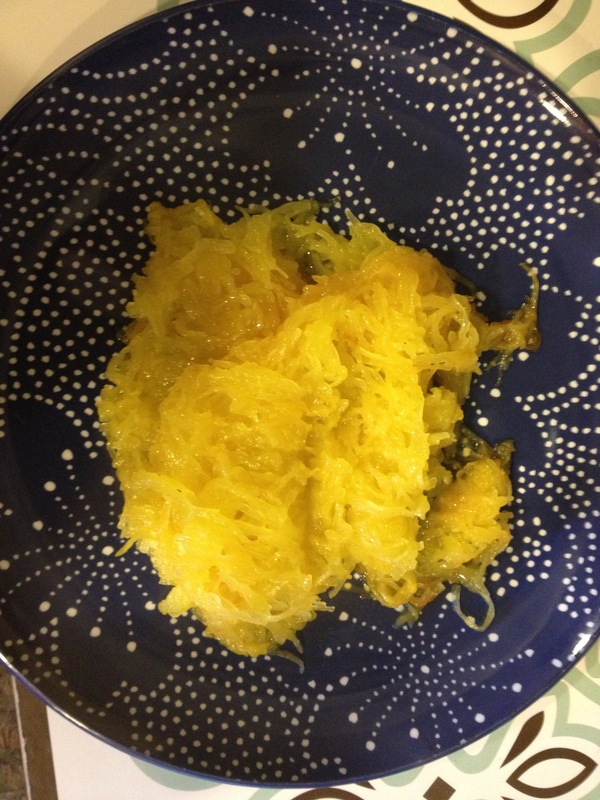 Now you can arrange the squash on the plate or bowl to look like spaghetti. And in our house spaghetti is never complete until you add the Parmesan cheese! 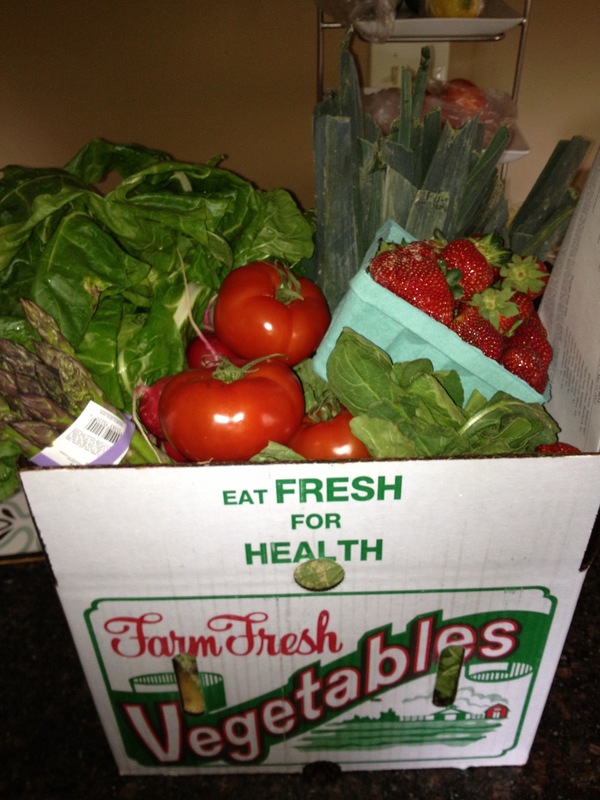 This spring, Jason and I joined this program near our house called fresh box! Basically you pay a weekly fee, and receive a box of fresh veggies and fruits. This has been a lot of fun! I drive to the store each week and they bring the box out to my car! Between this and Shoprite from home were really getting spoiled. The whole point of the drag box program is to eat local and what’s picked desk weekly. Every week is a surprise and we have already eaten something new at least once each week. What’s nice about this program is they also provide suggested recipes for each item. 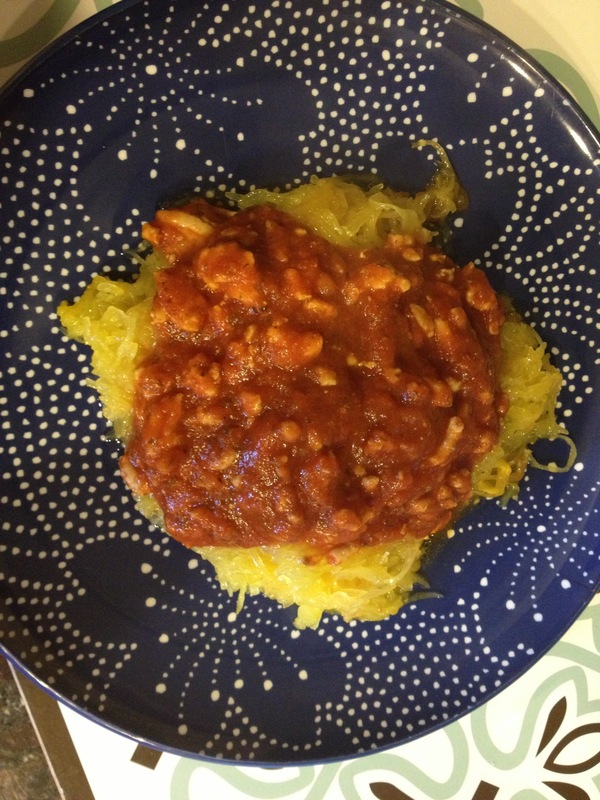 This week there were a few unfamiliar items that we were nervous to try…. 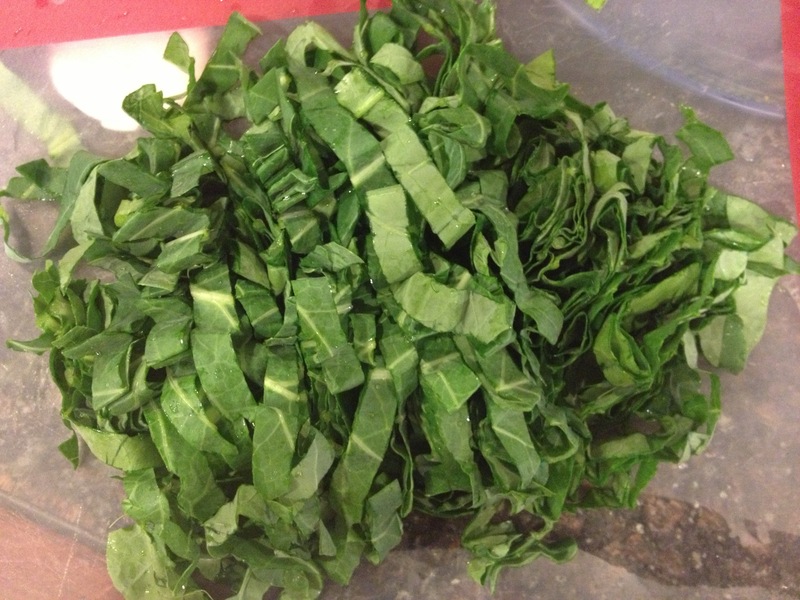 Collard greens and bak choy. 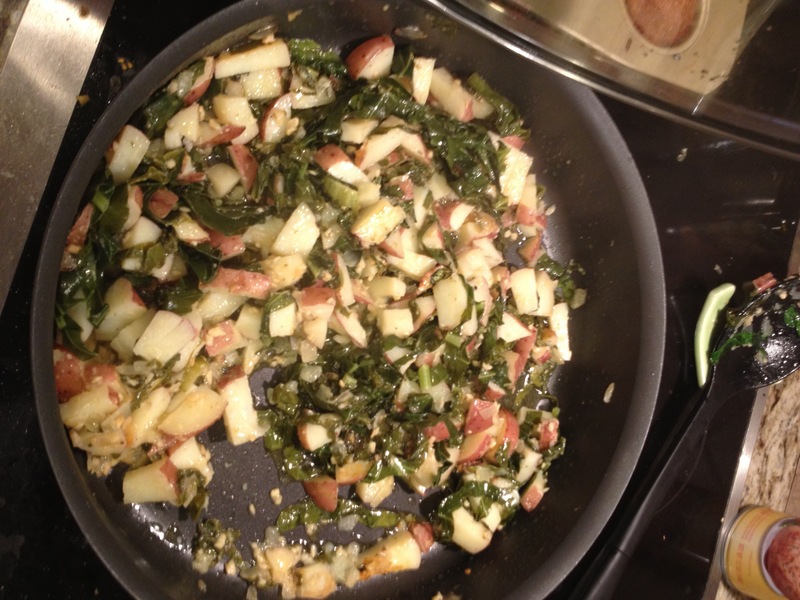 I decided to give their suggested garlic potatoes and greens a whirl and was so happily surprised. 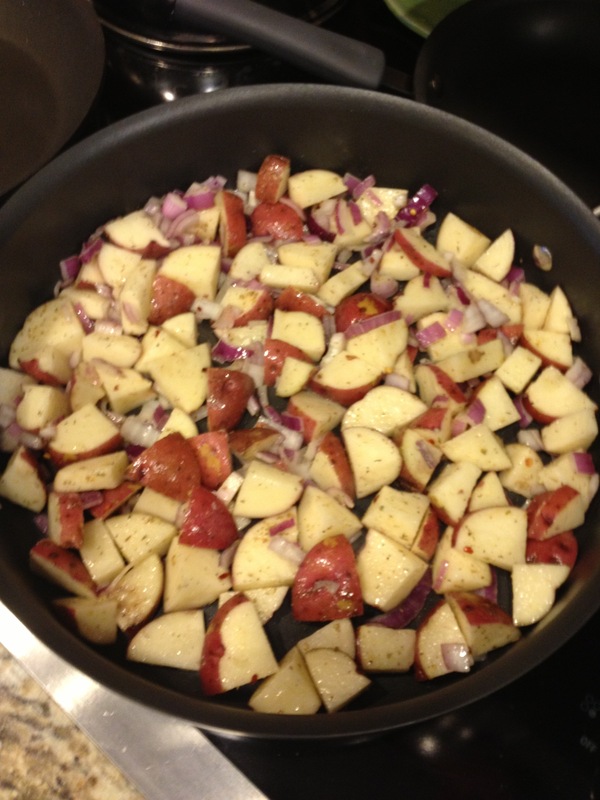 Pour some olive oil in a large skillet over medium high heat. 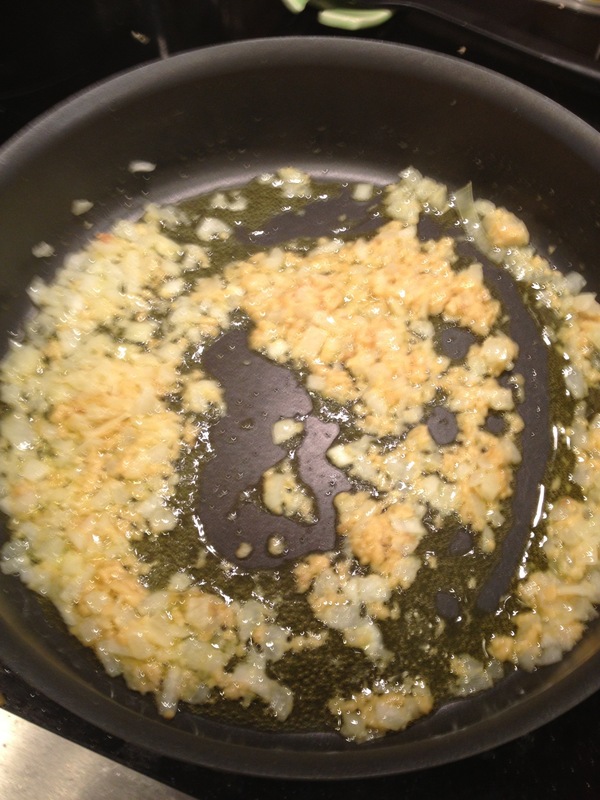 Add chopped onion and garlic and sauté until translucent 5-8 minutes. 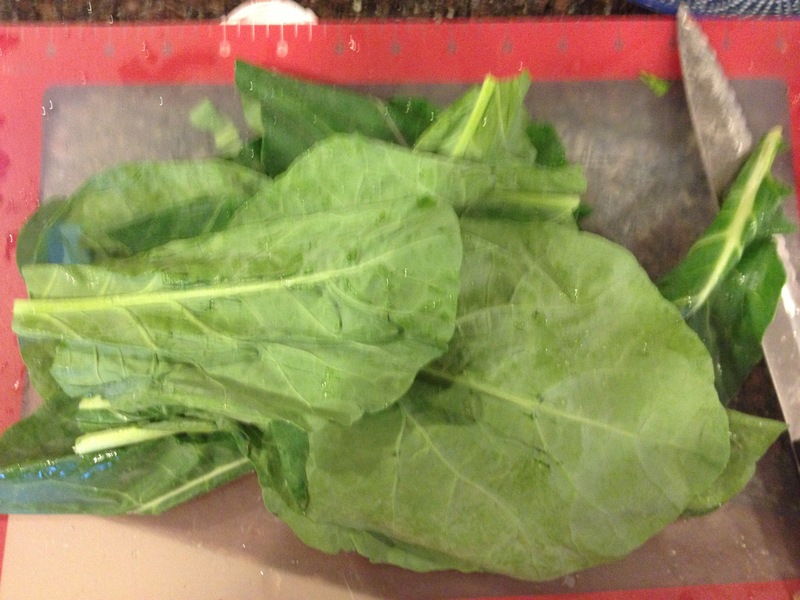 While these were cooking I chopped the collard greens. 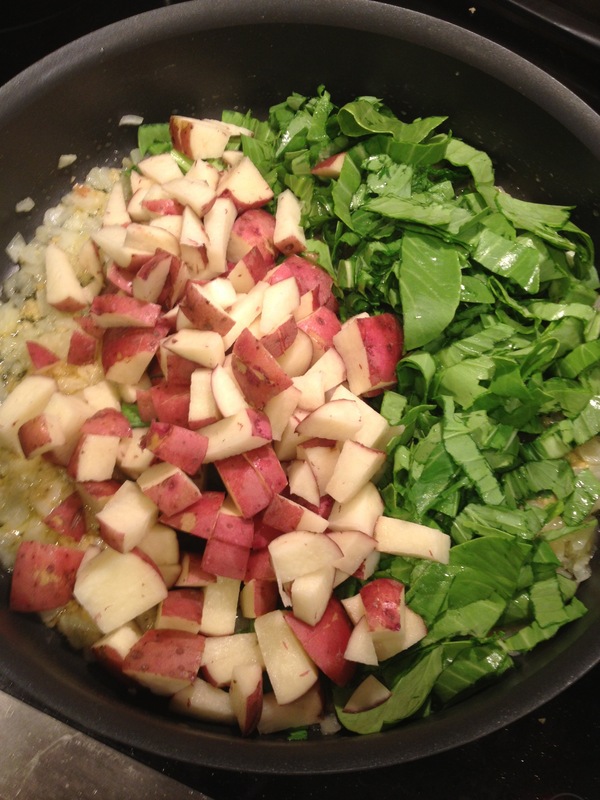 Then I added the chopped greens to the potato mixture, covered, and cooked for 15 minutes. 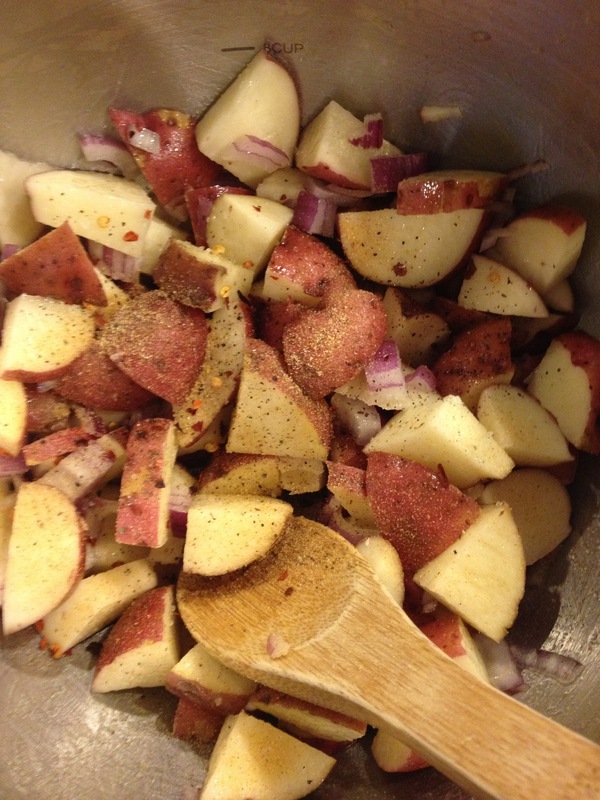 Right before serving, add salt, pepper, and red pepper flakes to taste. 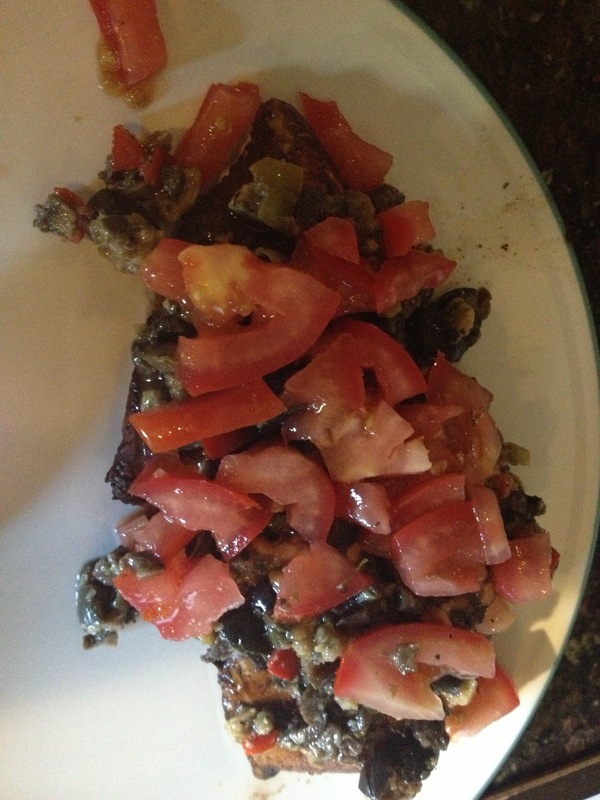 This was delicious my husband and I both loved it!! The next day we added some leftover steak for lunch and it was even better!! 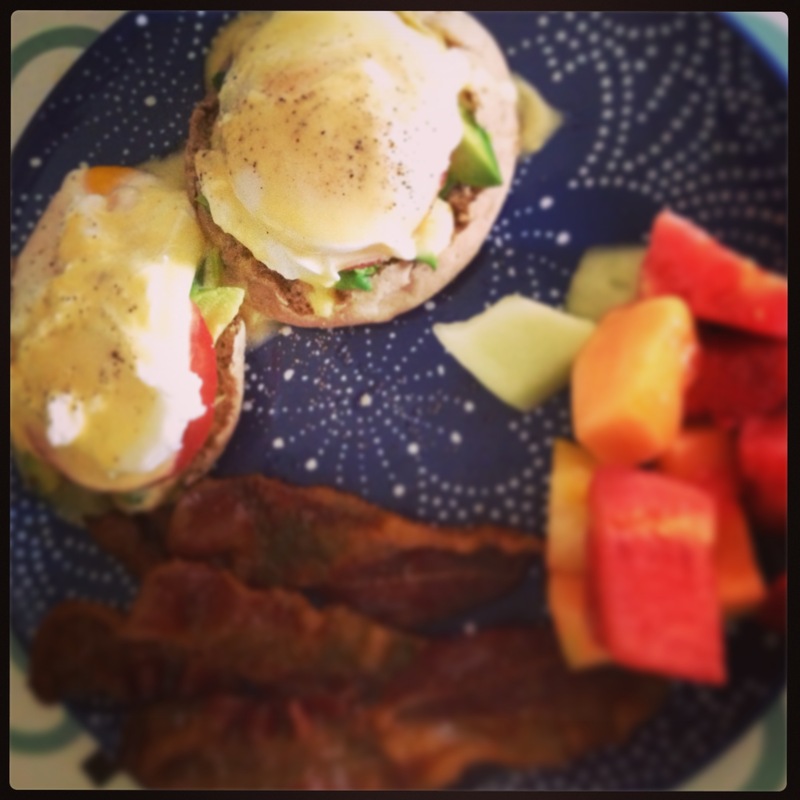 I was recently introduced to Eggs Benedict by one of my friends and instantly fell in love! 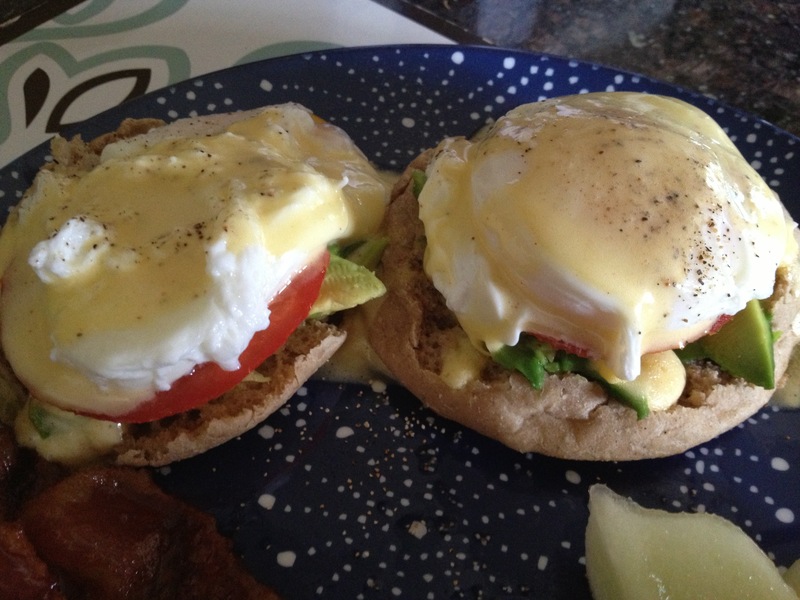 I’ve started to order them at restaurants and even have gotten a little adventurous by trying different versions like crab and spinach Eggs Benedict… Yum! I was discussing with the same friend how much I had fallen in love with them and wondered about making them myself. We are really big breakfast people in our house, and all of my friends agreed of anyone could make them I could. CHALLENGE ACCEPTED! I promised my friends that I would practice/ figure it out and the next time they came for a night we would have Eggs Benedict for breakfast. Well…. 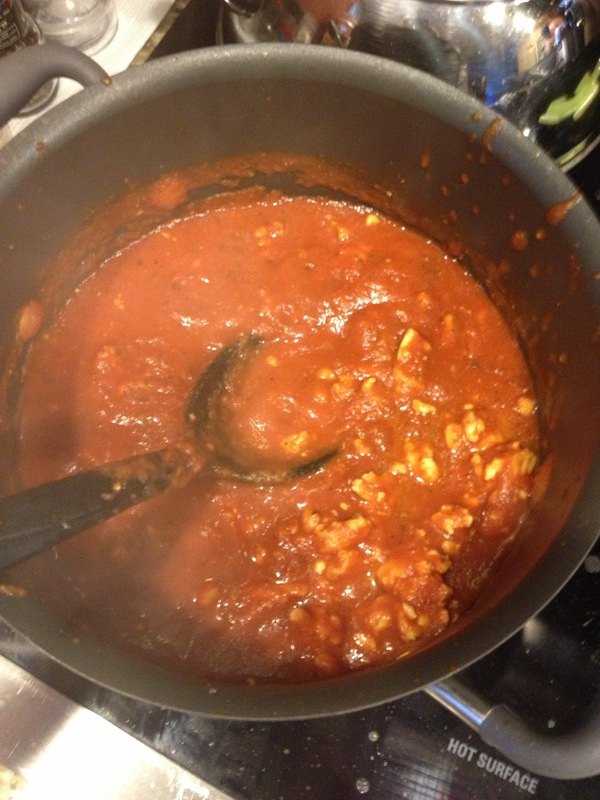 I made them…. I learned how to…. And I also leaner I will never be doing it again. “Nothing is too much trouble if it turns out right” ….. I changed my mind, to much trouble, even though it turned out right. I would rarer cater breakfast for 25 then make Eggs Benedict for two. I have to say they were delicious, with avocado and tomato, we definitely enjoyed them, except for the fact that I had to eat with my left hand because I couldn’t feel my right arm after what seemed like hours of whisking. 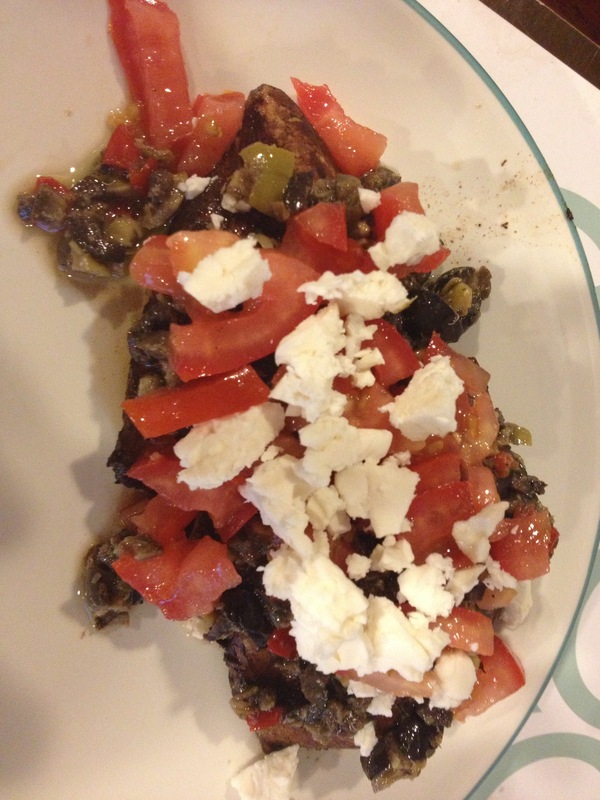 And now that I’ve completely motivated you to attempt these… Here is the recipe I used. 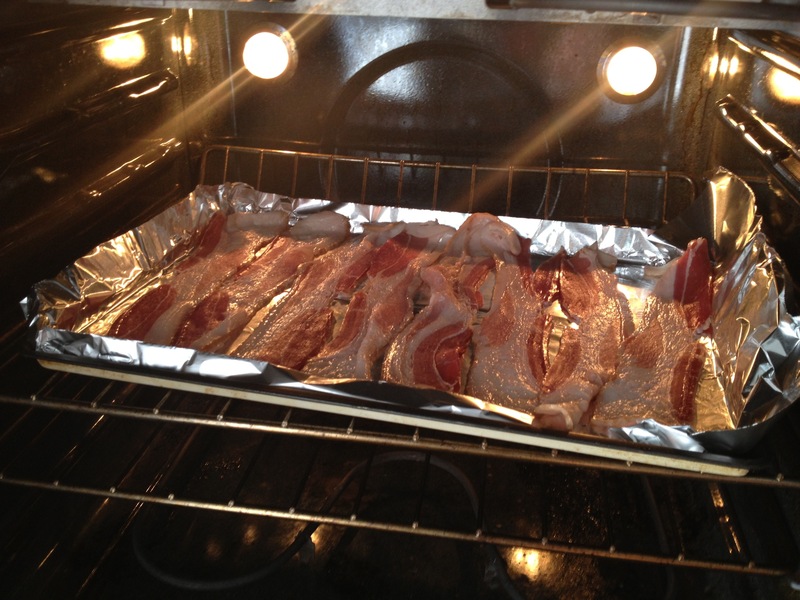 As a side note we absolutely love bacon, and have found that our favorite way to cool it is in the oven, I set the oven to 350, put the bacon in and let it cook while I making the rest of breakfast. 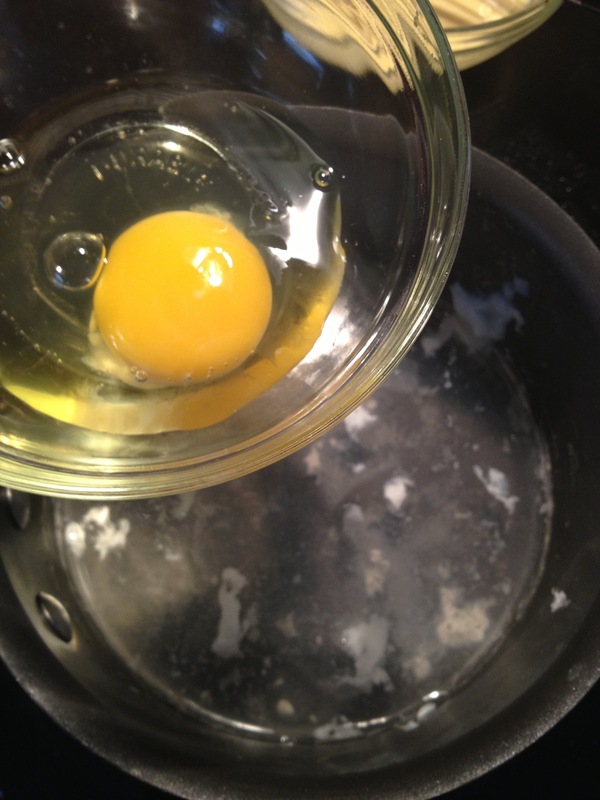 Put a small double boiler together and brig the water to barely a simmer, you don’t want too much heat or the yolks will cook. 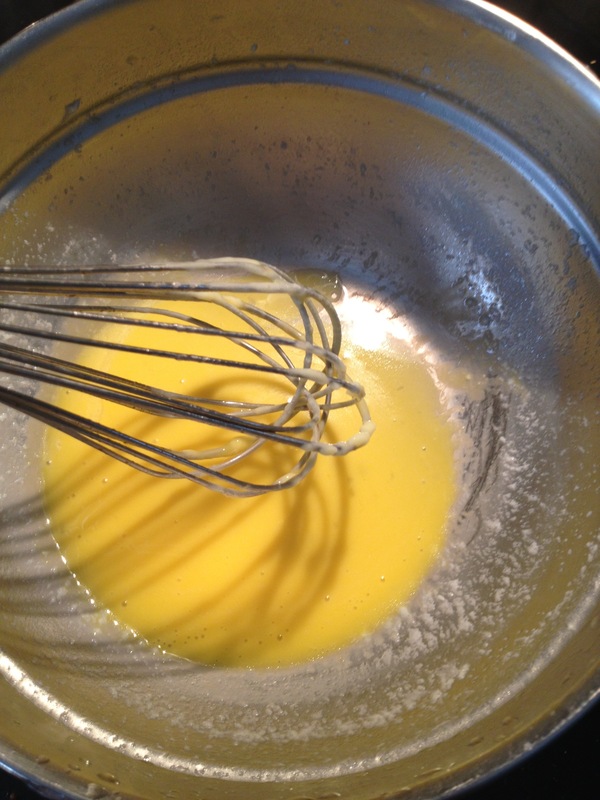 Start by whisking the two eggs yolks and lemon juice together in a small bowl. 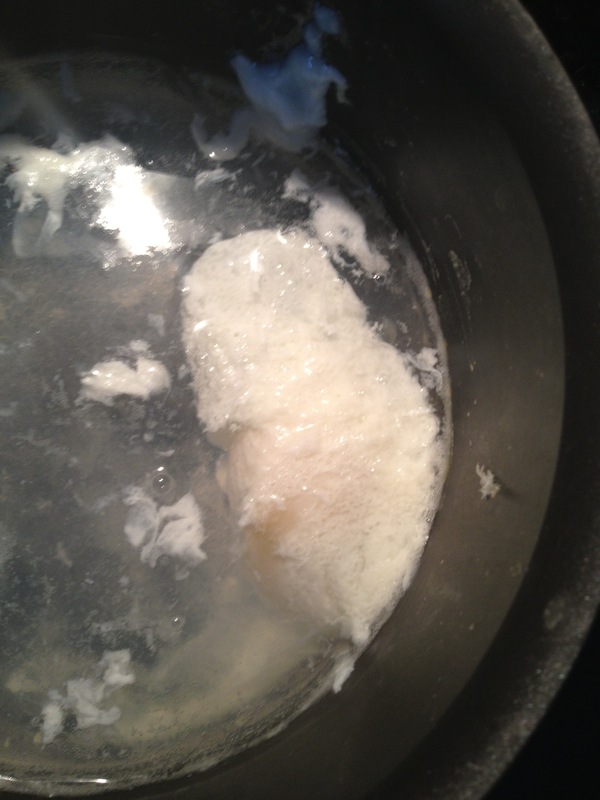 Add it to the double boiler and heat the butter in the microwave to melt. 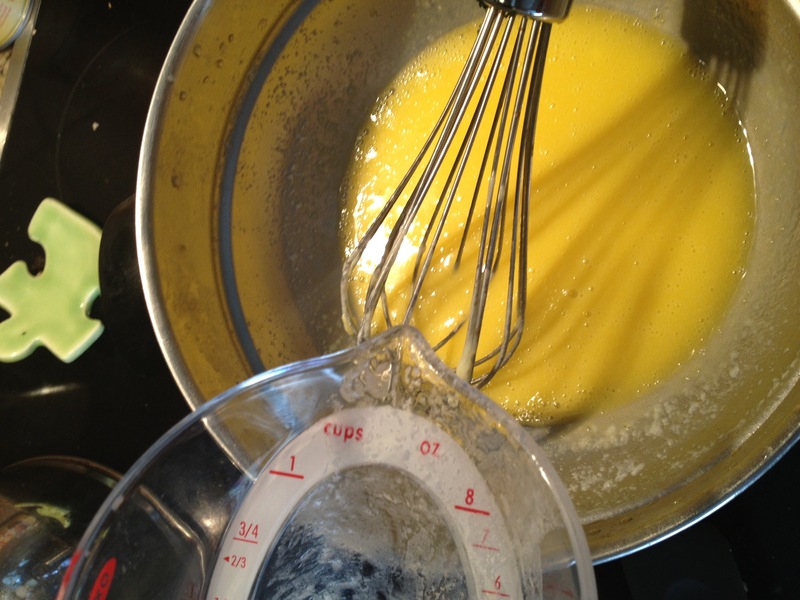 Continue to whisk while you slowly add in melted butter. 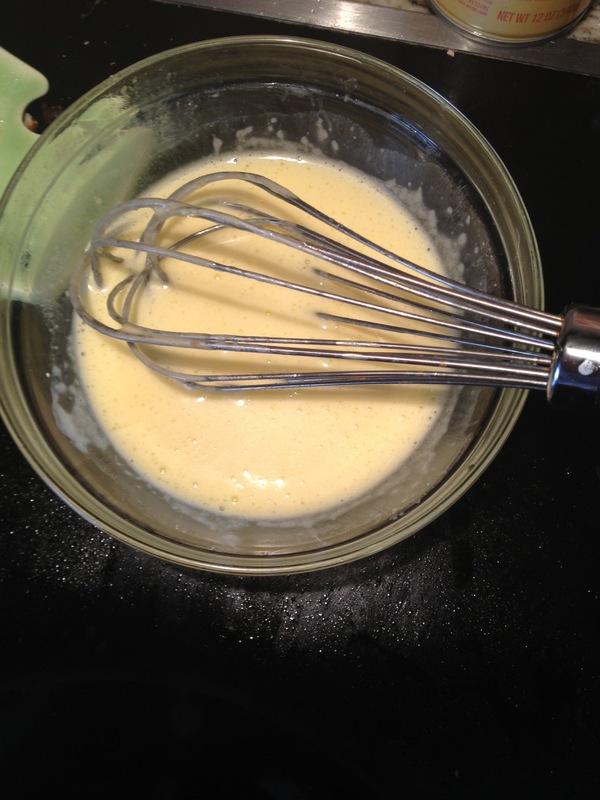 Now you whisk, whisk, whisk, and whisk some more until the sauce thickens… Here’s what mine looked like. I kept the sauce near the stove to keep it warm. 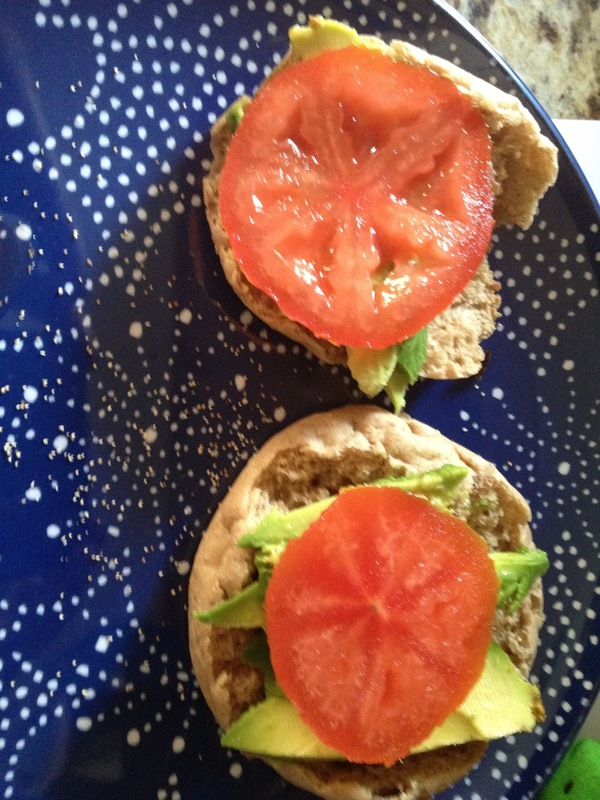 Before I poached the eggs, I toasted the English muffins and assembled the tomato and avocado slices. 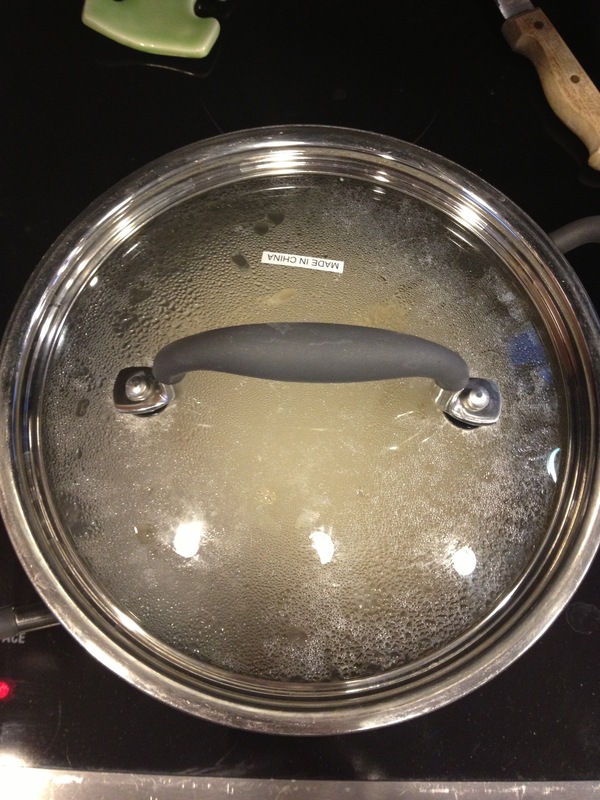 I used the same water from the double boiler and added a little but of white vinegar to the water. 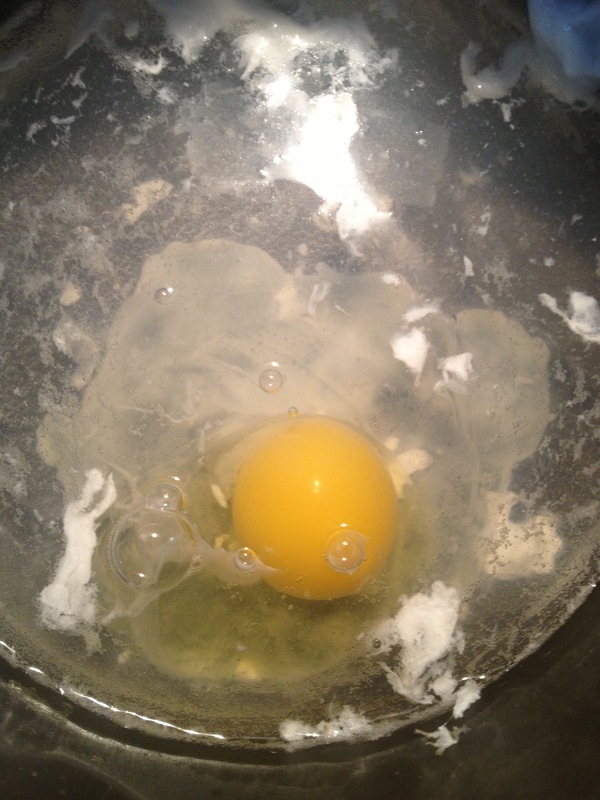 First crack an egg into a bowl because its easier to pour. 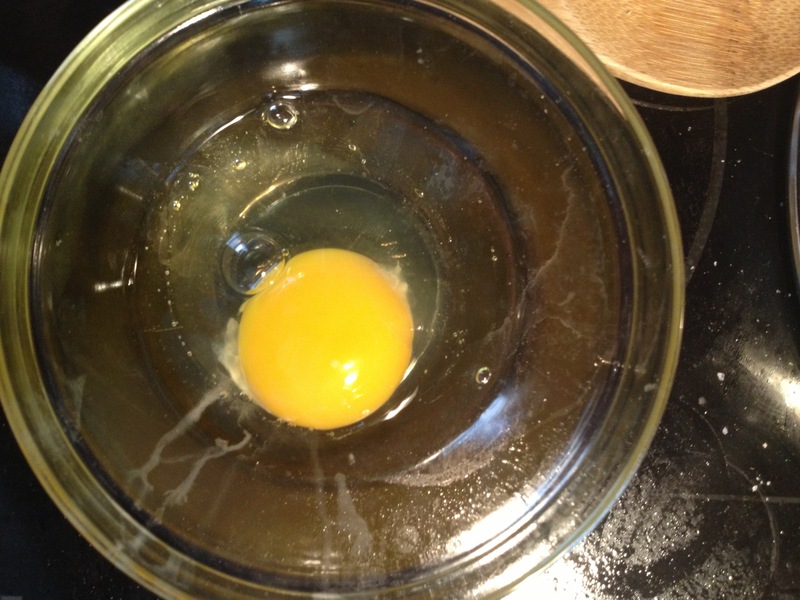 The water should be just about to boil, but don’t let it start, pour the egg in. It should cook for about 4 minutes. I let it cook for 30 second and let the white firm a little. 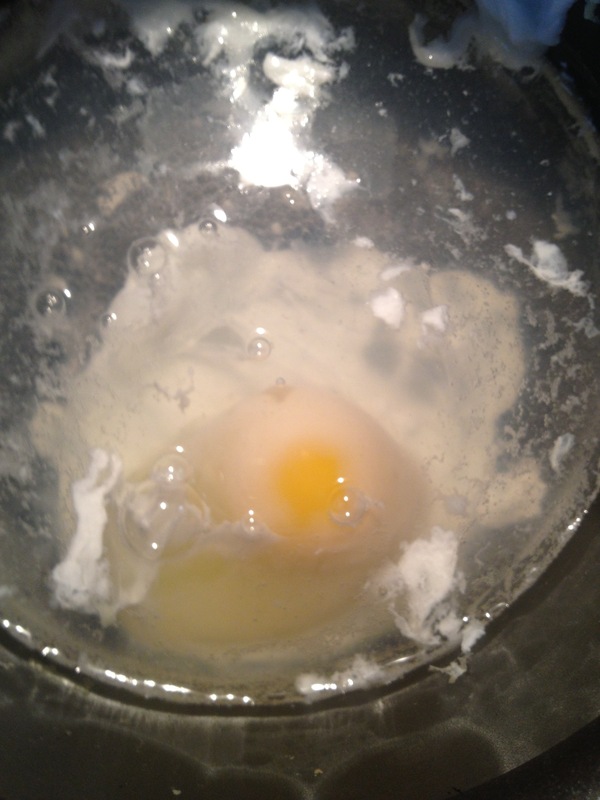 Then I took a spatula and flipped the egg over carefully and let it cook the rest of the way. Added them to the English muffins and sprinkled with salt and pepper. 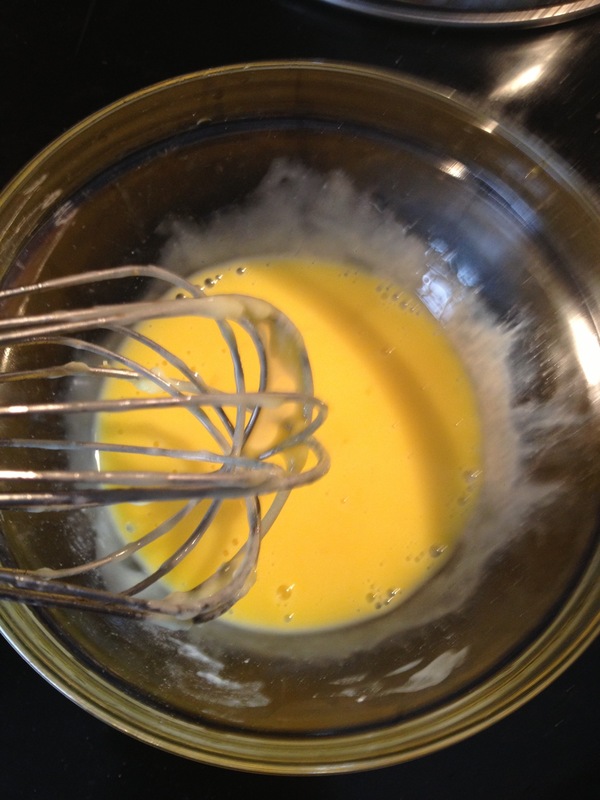 When they were all assembled I drizzled them with the hollandaise sauce. And voila! 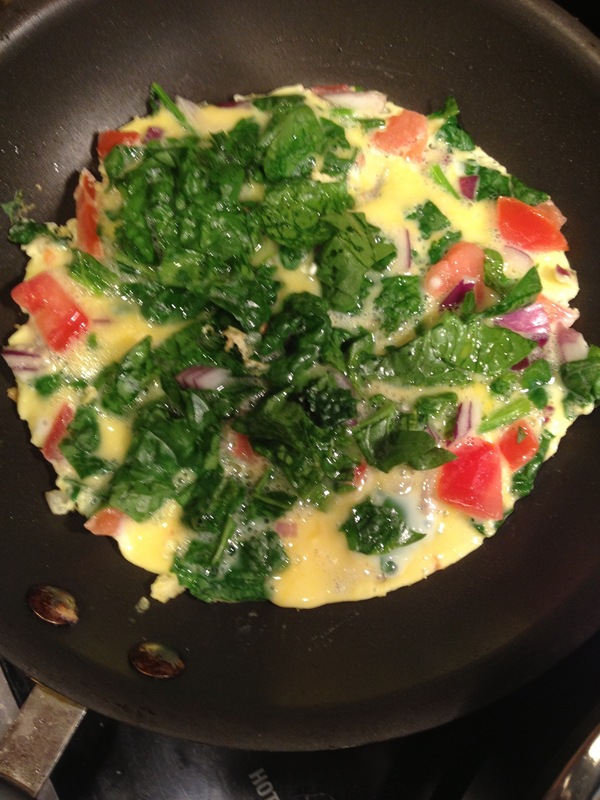 The most labor intensive breakfast I have ever made… At least it’s pretty. 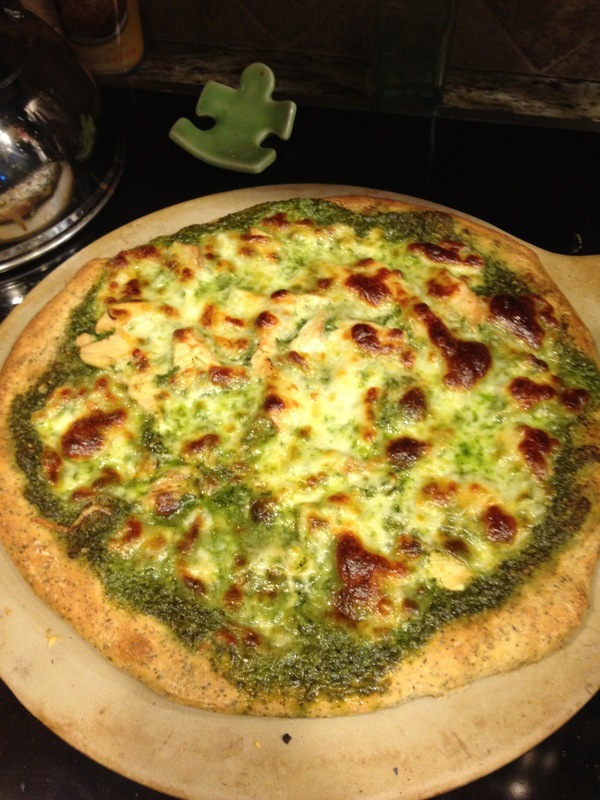 My husband and I always try to “eat clean” and healthy, but we both love pizza and pasta and its hard to give up. We have successfully given up store bought pasta and only have it if its made from scratch which we think helps. 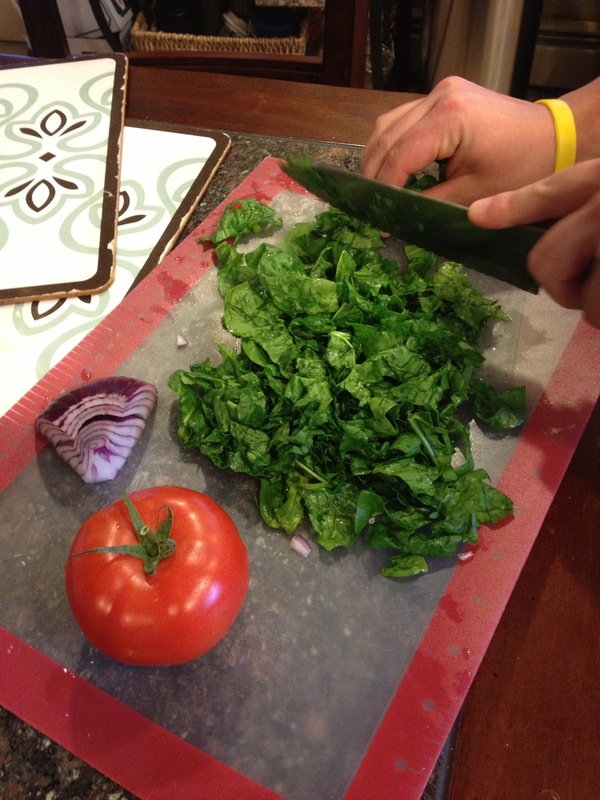 Even with that switch we are always looking for healthy alternatives and substitutes. 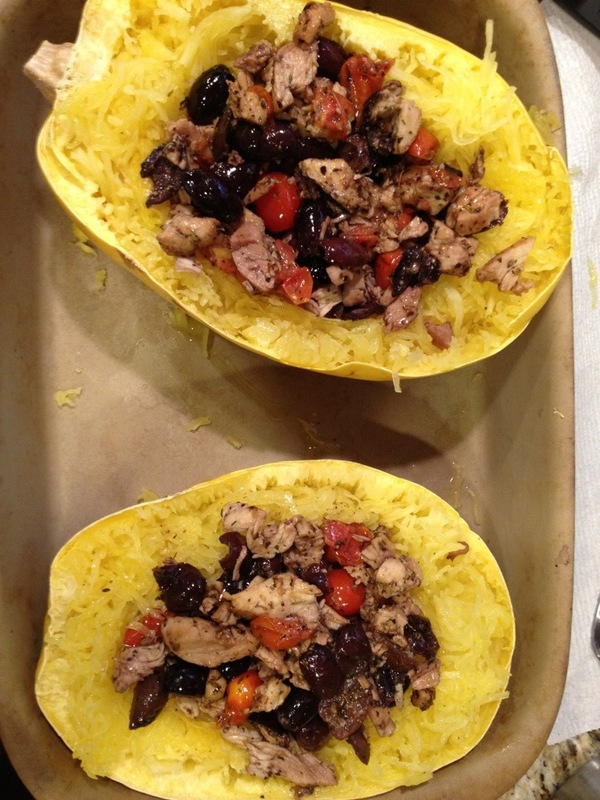 We may be late to the game on this one, but we have a new found love of spaghetti squash. While nothing will ever taste as good as fresh pasta, this is a great weeknight substitute that is much healthier! For those of you who don’t know Jason is always a little hesitant when it comes to new veggies and is quick to tell me his true feelings, but the first time I made this it was an instant success. 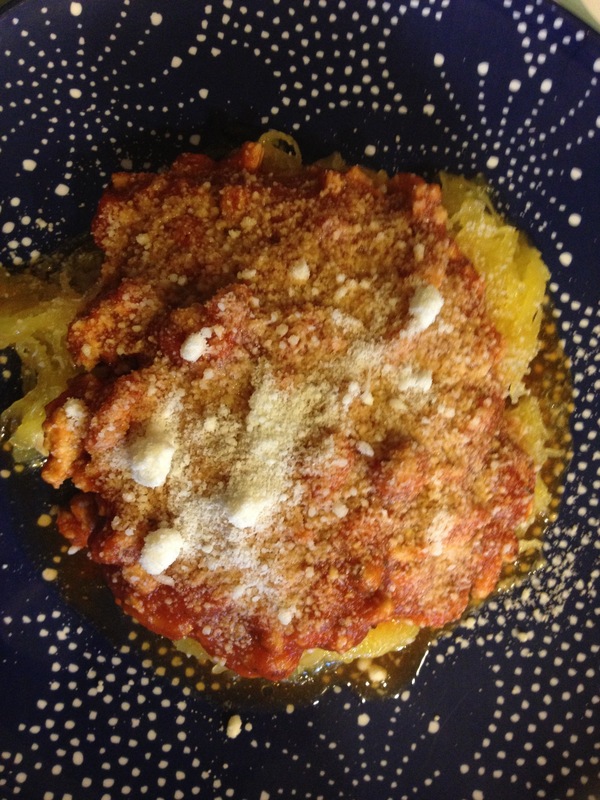 Unfortunately spaghetti squash is a winter squash and isn’t so easy to find right now. We got lucky this weekend when our local grocery store just happened to have a few. I stumbled across this recipe on Pinterest where I find so many of my good recipes, and thought it was too good not to share. 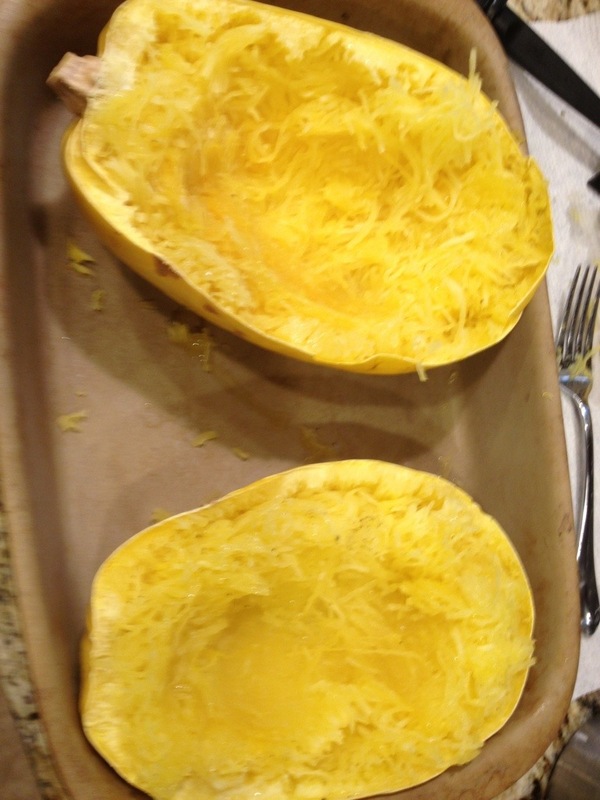 I think the hardest part about preparing spaghetti squash is cutting it open, but that’s where you have to start. 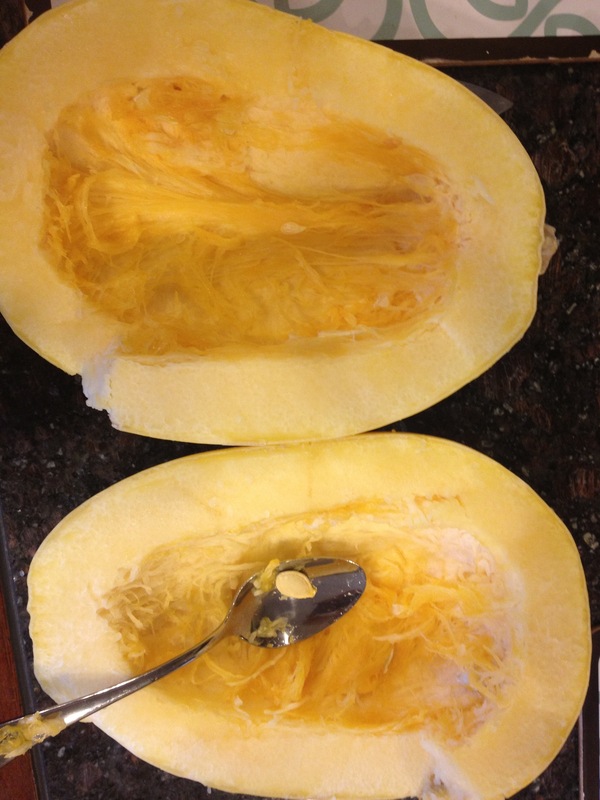 Once it’s cut open you need to scoop our the seeds which remind me of pumpkin seeds. 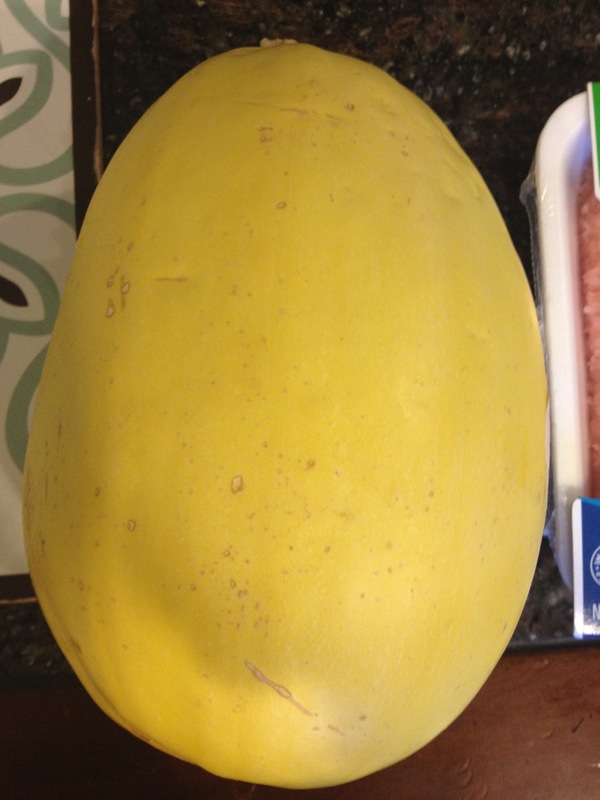 Next you have to place the squash flesh side down in a microwave safe bowl or plate. Put it in the microwave for 10-15 minutes depending on the size of the squash, this was a big one so it cooked for about 12 minutes. 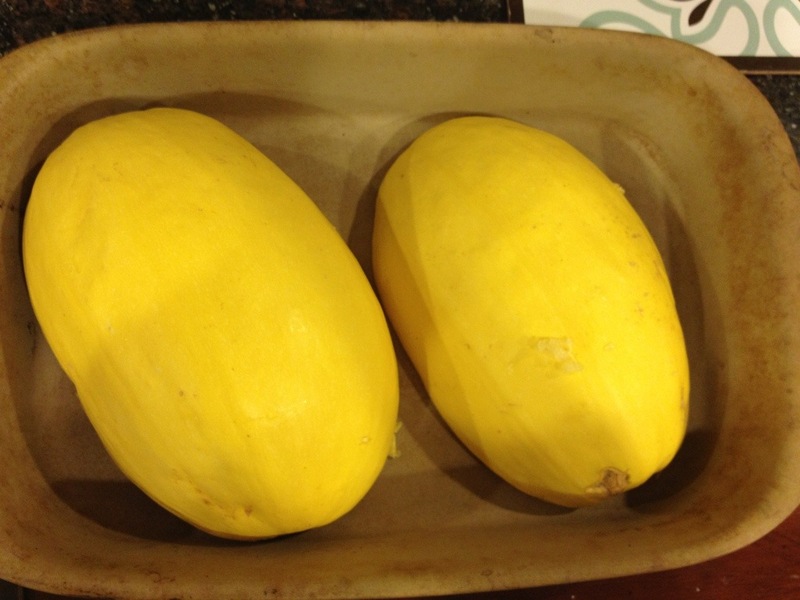 While the squash is cooking preheat the oven to broil (500). And start preparing the filling. 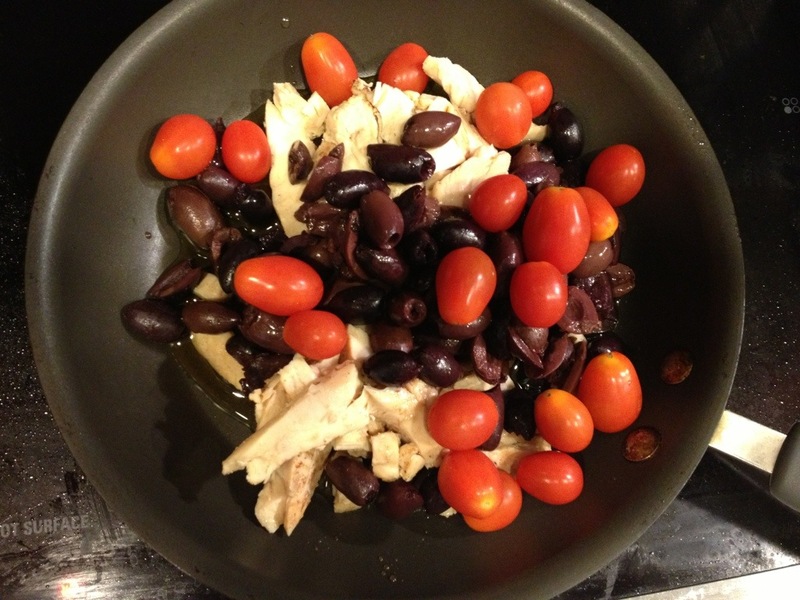 Lightly cover the bottom of a frying pan with the olive oil and over medium heat brown chicken, tomatoes, and olives. I always eyeball my spices when I cook especially when a recipe should be made to taste. My advice for this and the way that I leaned is to start measuring at small intervals like 1/8 or 1/4 of a tsp and keep adding until you like the look and taste, once you find that measurement wrote it down and use that the next time you make the recipe. Over time you will just begin to judge how much you want by looking. For this recipe I just coated the filling with the spices like this. 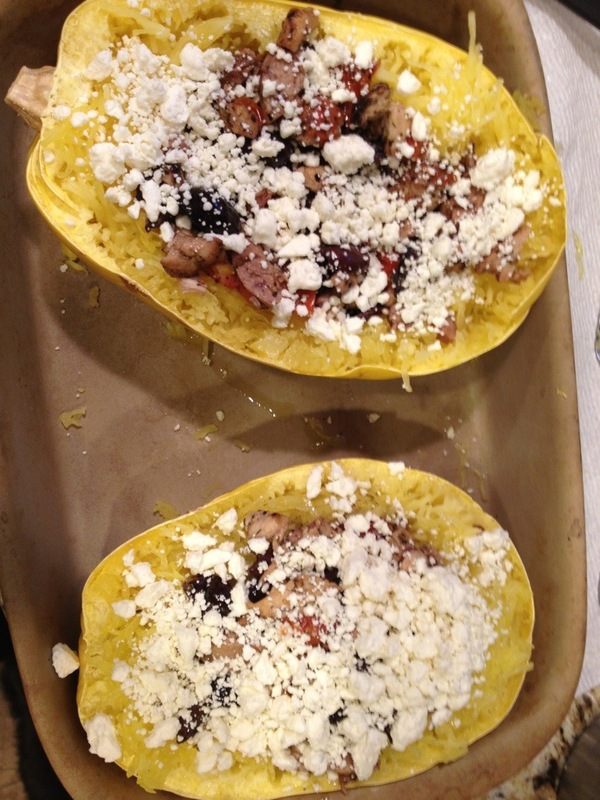 I cooked the filling for about 10 minutes while the squash was cooking. I mashed the filling every few minutes. 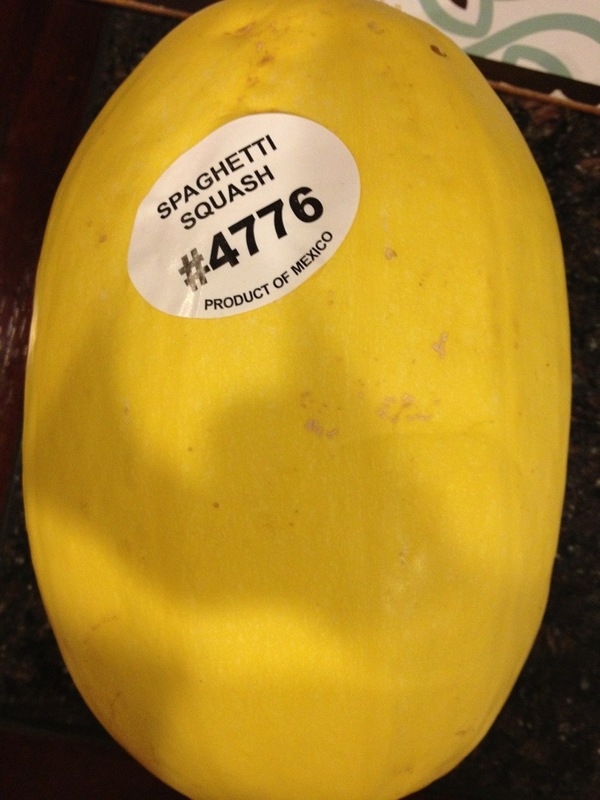 Once the squash is cooked you just run a fork through it until it looks like spaghetti, leave a whole on the middle for the filling. And broil for 5 minutes. 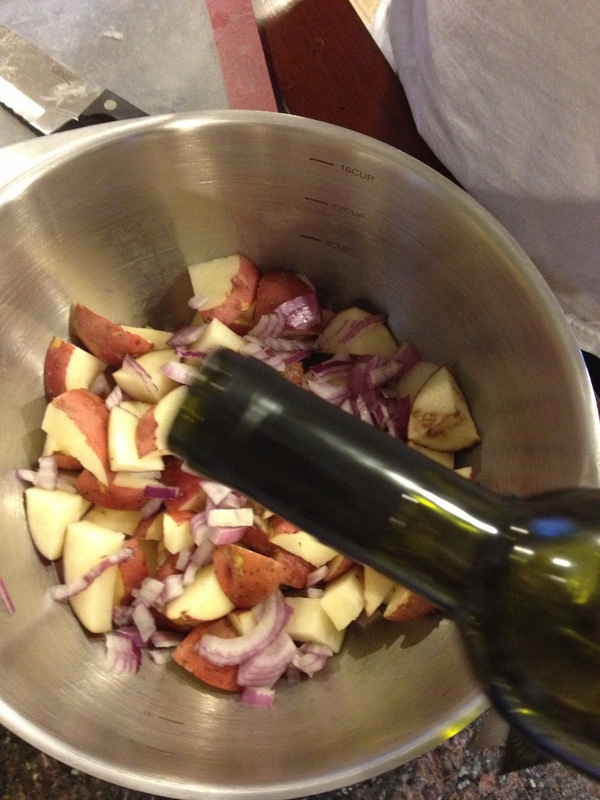 It’s super yummy, quick, and healthy!! !